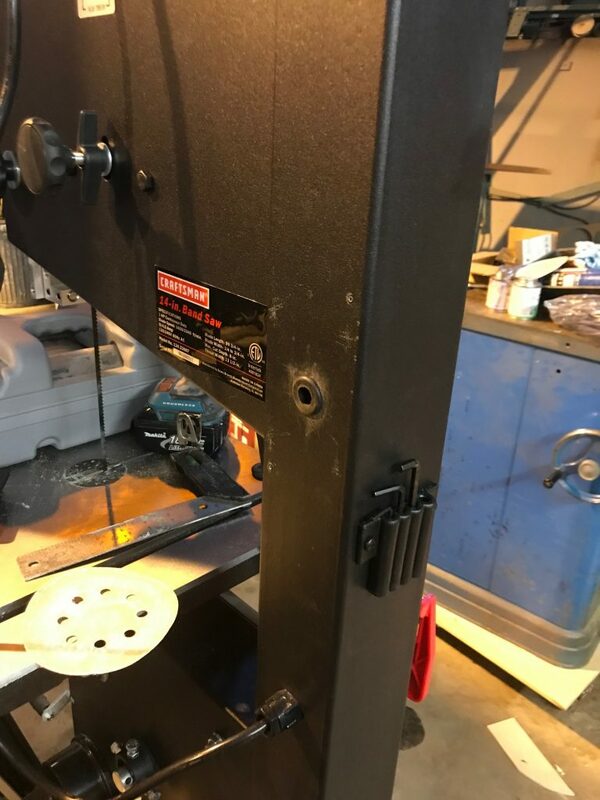 Over a year ago, I purchased a Craftsman 14″ bandsaw for about $350. For the price I paid for a brand new bandsaw, that was actually a pretty solid deal. 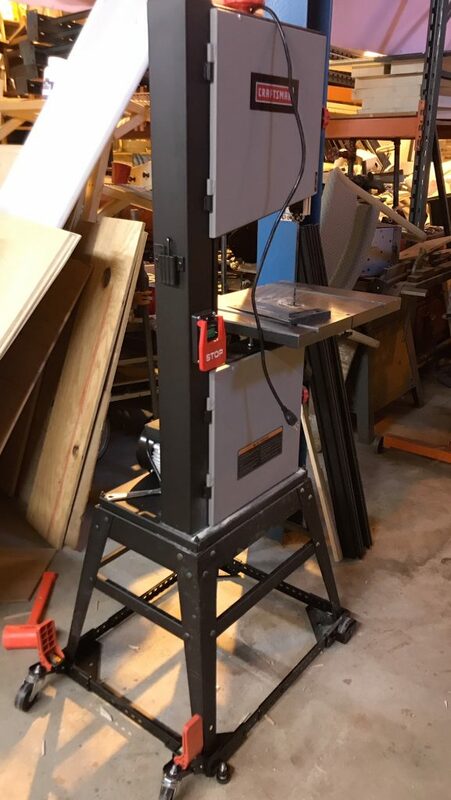 Since this was sold as a “stationary” bandsaw (not mobile whatsoever), I snagged a universal mobile base off Amazon. Not the most rigid mobile base, but it does the trick. I’m all about mobility and the ability to move my equipment around if I need to, since my working space is limited. Some reviews complain about the orange levers on the base that have tabs that tend to break off when the casters are engaged, but I haven’t had that experience in the past with this base on my other equipment. 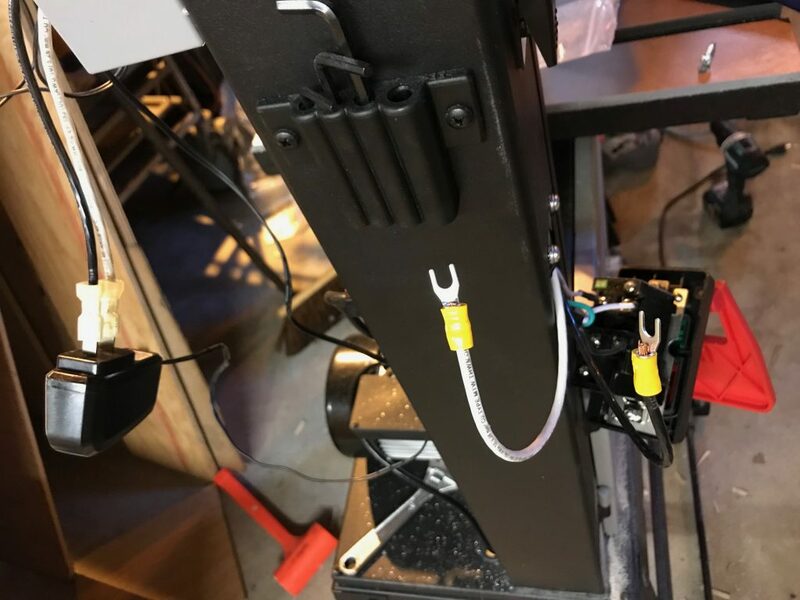 I will admit, one annoying takeaway, and this is common for any base with 2.5″-3″ casters, is that a small wire or cord will snag up the casters, and you won’t be able to push the mobile base anymore. All the more to keep your work space clean from debris! And then there was light! 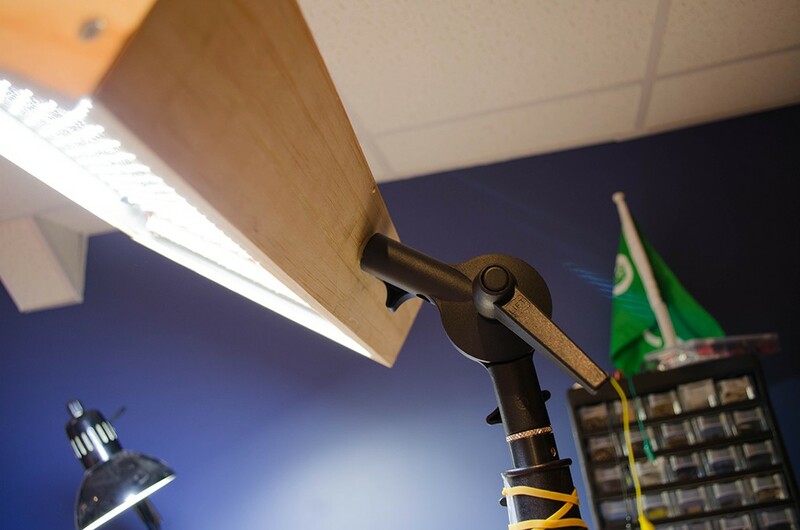 Since I don’t have a lot of great lighting at my workshop, I wanted to add a work light to the bandsaw. I found a flexible single LED lamp lying around (aka FREE! ), so I tested it. Fortunately, it was in working condition, although a bit scuffed up, but the light worked. I grabbed an exterior metal single gang box, drilled a hole for the LED lamp to mount to, and fed it through. I also saved the 2-prong wall wart as well. Bought myself a fancy “Zombie Lights” 12V switch on eBay as well (I thought it’d be unique). So the 12V switch is basically inline with the 120VAC wall wart. 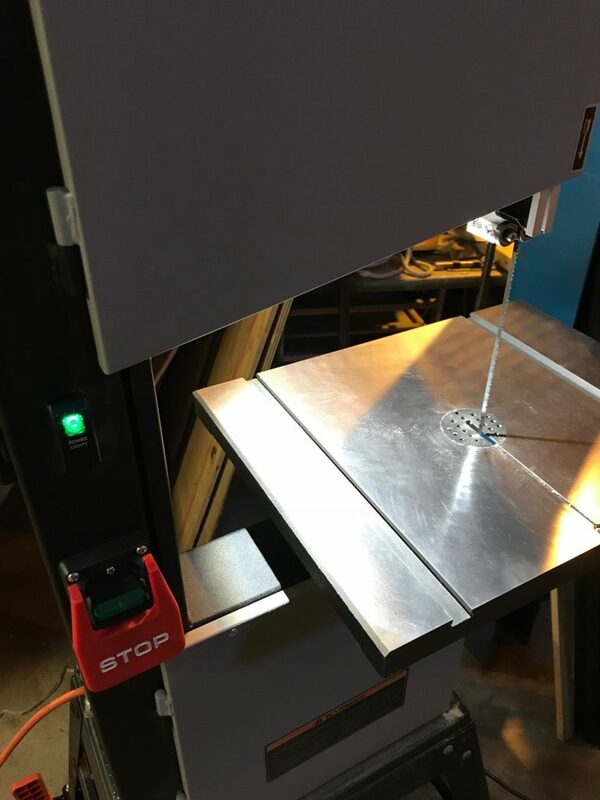 At the bandsaw, I decided to mount the electric gang box on the back of the bandsaw. Lined up where I wanted to mount the gang box and drilled out a 3/4″ hole to feed wires into the main vertical post. Also tapped 2 holes for securing the gang box to the post. I also used a rubber grommet to protect the wires from chafing/rubbing against the hole I cut, since I was feeding wires through that hole. Next, I took off the ON/OFF paddle switch on the front of the bandsaw, and spliced some wires to the 120VAC main. I fed those through the hole I made, and connected the other end to the wall wart. Fortunately, this wall wart doesn’t care about polarity or a grounding wire, so figuring out which prong to connect to the hot and neutral lines is whatever. I also cut a rectangular hole on the front to mount my switch. 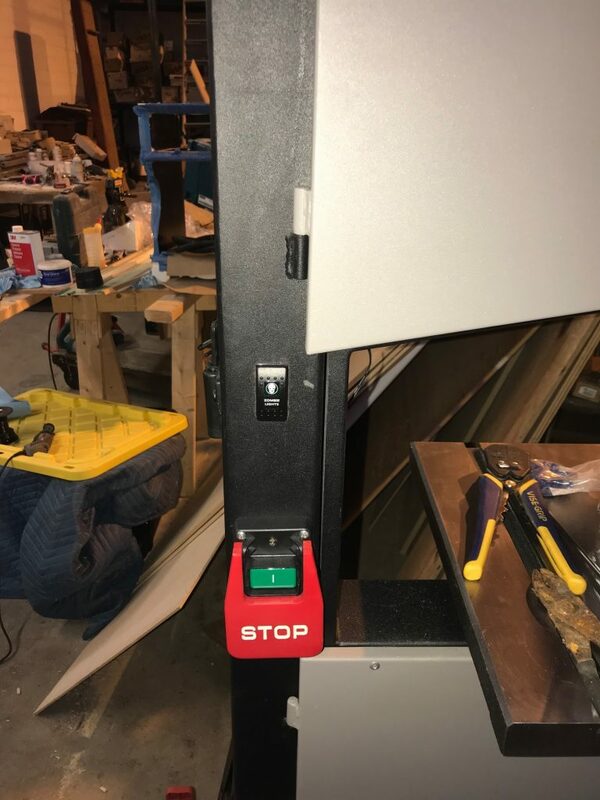 I made sure I mounted the switch well below the top door for the top wheel of the bandsaw, so that the top door could open as far as it could without interfering with the switch. Here’s a view of how everything looks in the gang box. I made sure that the gang box was large enough to hold the wall wart so that everything could be concealed. Might not be exactly to code, but it works. Here’s the view of the 12V illuminated “Zombie Lights” switch. I love the look of it because the black switch looks almost OEM on the bandsaw…with the exception of the “Zombie Lights” silkscreen text. Overall, I think this brings much added value to the bandsaw. Some people may cringe at the thought of buying a brand new piece of equipment and then shortly modifying it. But from an engineering standpoint, I’m always thinking of how to improve on a product. 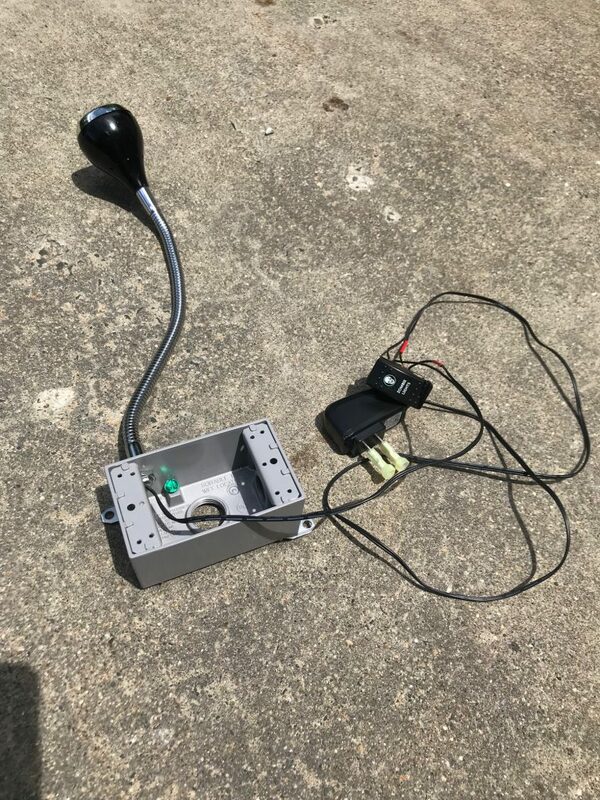 In this case, I spent an additional $20 for the weatherproof electrical single gang box, some spade connectors, grommets, and the 12V “Zombie Lights” switch off of eBay. The LED light was free, since I found that lying around in a garbage heap. 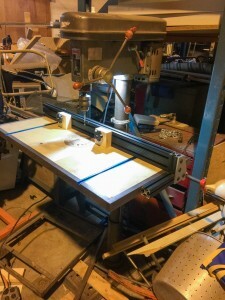 Compare this to the Pro Light system for the Laguna bandsaw, which costs $99 and the HTC A100-16 add-on (which include a built-in blade guard), which are both fixed position light systems. 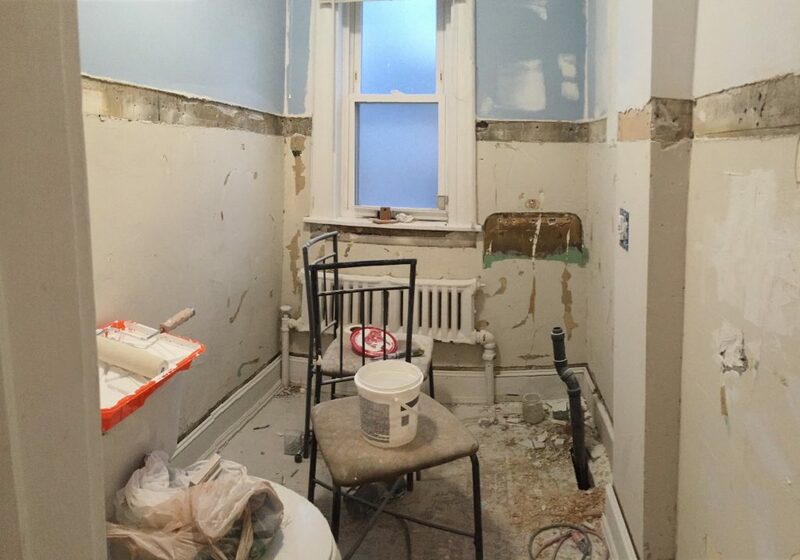 Fortunately, the half bath was in pretty decent shape,…at the time of the renovation (we’ll get to the tragedies that ensued later). The existing sink was falling apart, and oversized for that small space. Also, the awful and tacky wainscoting of the 80’s/early 90’s had to go. Apologies for putting the random chair in the shot! Also a missed opportunity to show the outdated recessed medicine cabinet. The walls were painted with some color to robin’s egg blue. Seemed to brighten up the bathroom quite a bit. Replaced the light above the toilet with a brighter LED pull chain (the existing light was a pull chain too). 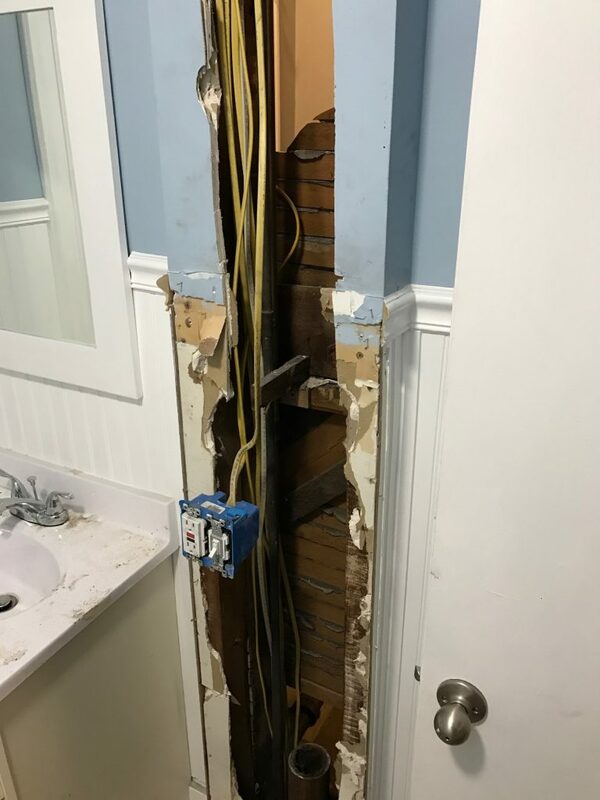 My friend RR helped with filling up the exposed wall where the recessed medicine cabinet was, as well as route some electricity for a vanity light. Once we spackled and hid the sheet rock where the recess used to be, onward with the wainscoting! 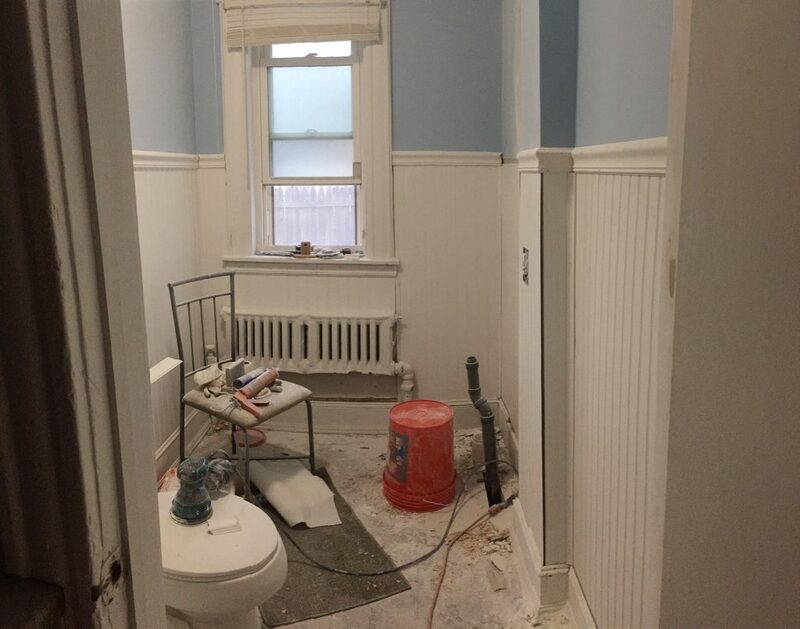 Wainscoting is probably quit a bit on the first floor area. 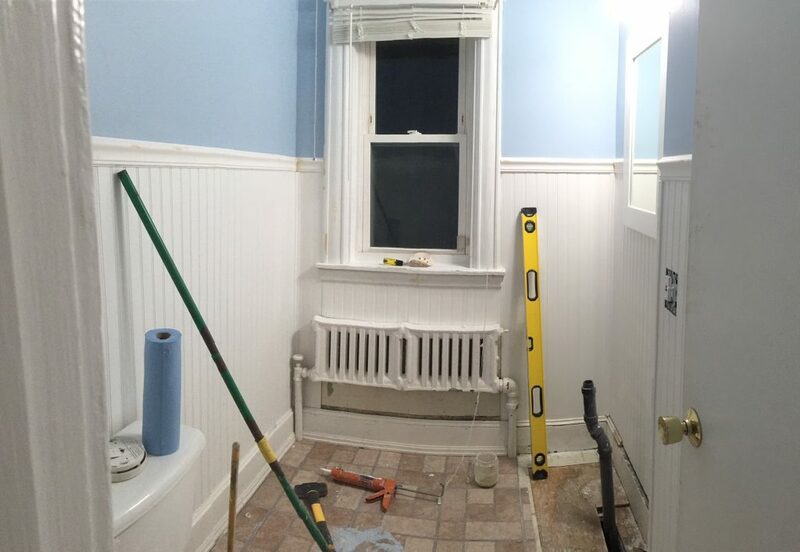 I figured it made the most sense to continue the wainscoting in to the half bath/water closet, since it was adjacent to the kitchen. 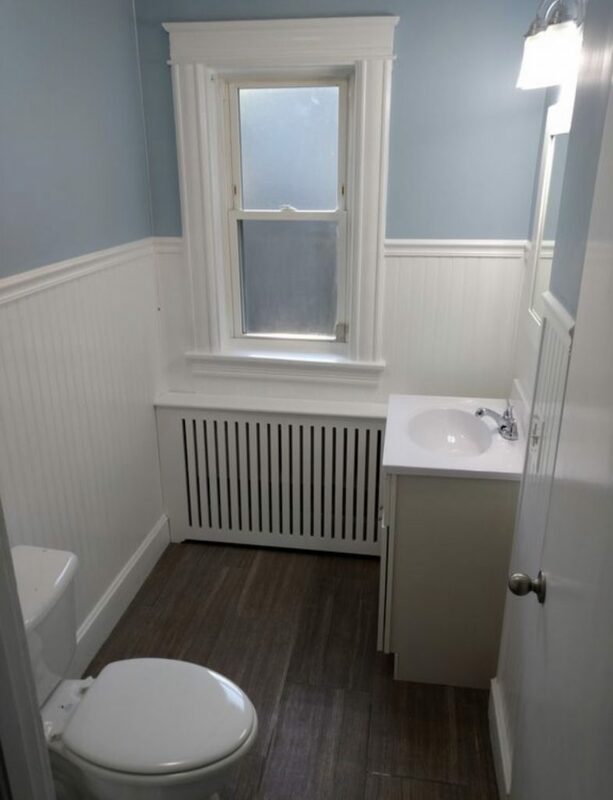 Unfortunately, for some reason, whoever did the work the property ages ago decided to set the height of the wainscoting in the bathroom much higher than the kitchen. 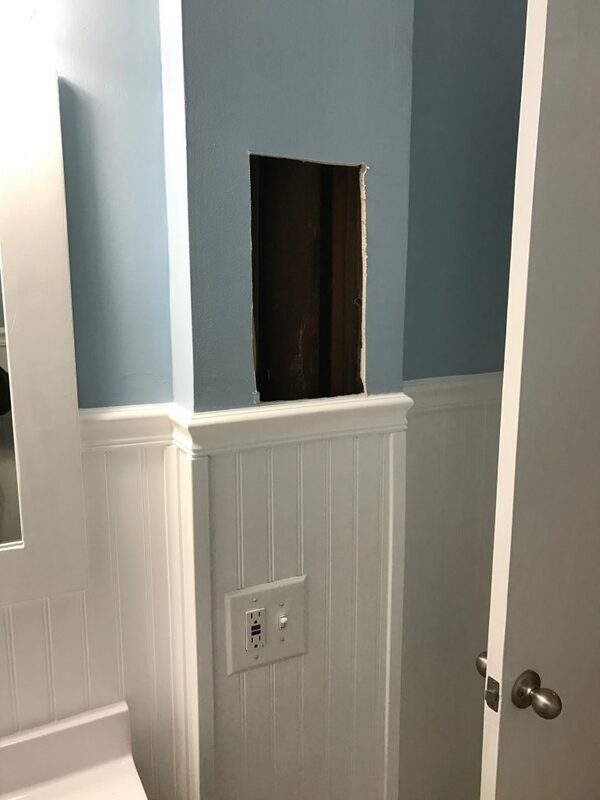 A little different, but again, there was about an 1/8 inch recess between the top half of the wall compared to the bottom half of the wall where the old wainscoting was. This was most likely done to make the chair rail sit flat between the wall above and the wainscoting. Well…at least more light than before. 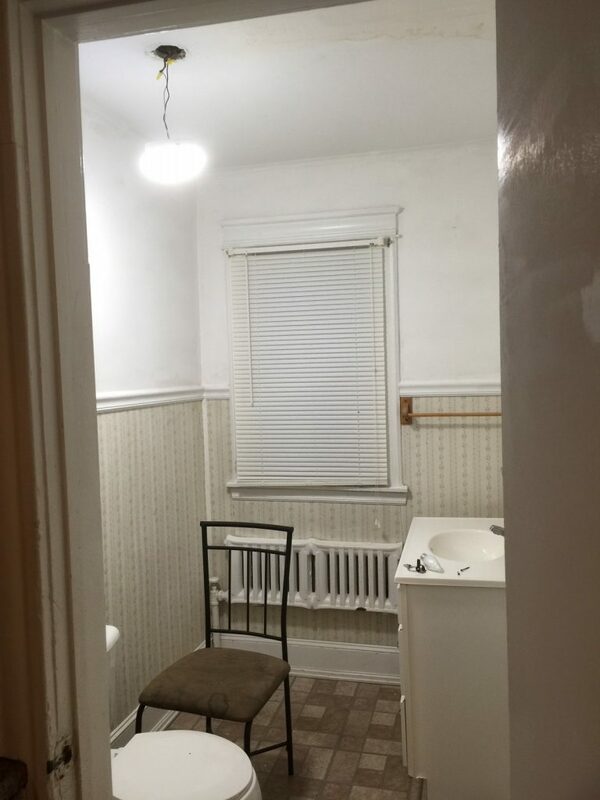 At this point the vanity mirror and light were installed, and the chair rail, which may appear to be straight, but it’s a bit off. I didn’t use my laser level, but it’s close-ish. Hell, it looks straight in the photos. We also removed the old electrical box and we added a new electrical box to include the GFCI outlet and new light switch for the new vanity light. I apologize for not having more photos through the steps, but basically sourced a newer, smaller sink, to make the bathroom feel bigger. The drawer fronts were matched to be very similar in style to the shaker-style cabinet doors in the kitchen. Installed an MDF radiator cover, and tiles as well, to complete the seamless feel between the kitchen and the half bathroom. 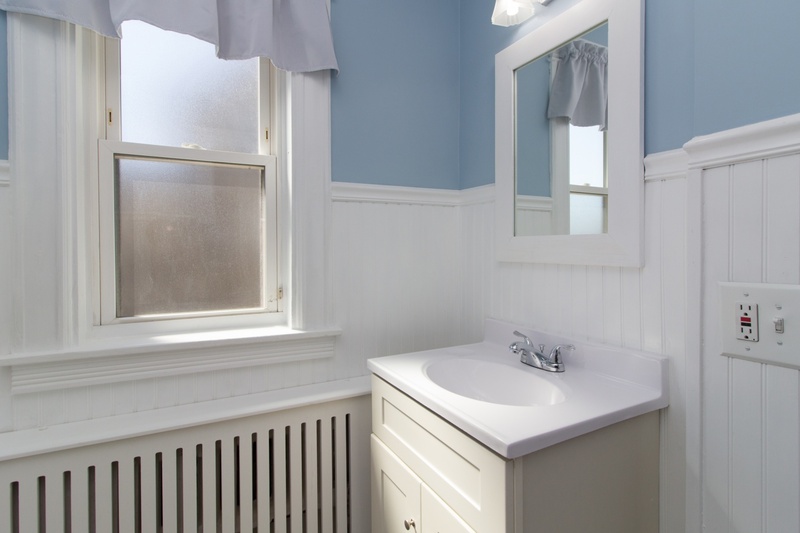 Overall, the bathroom is night and day from what it was originally. 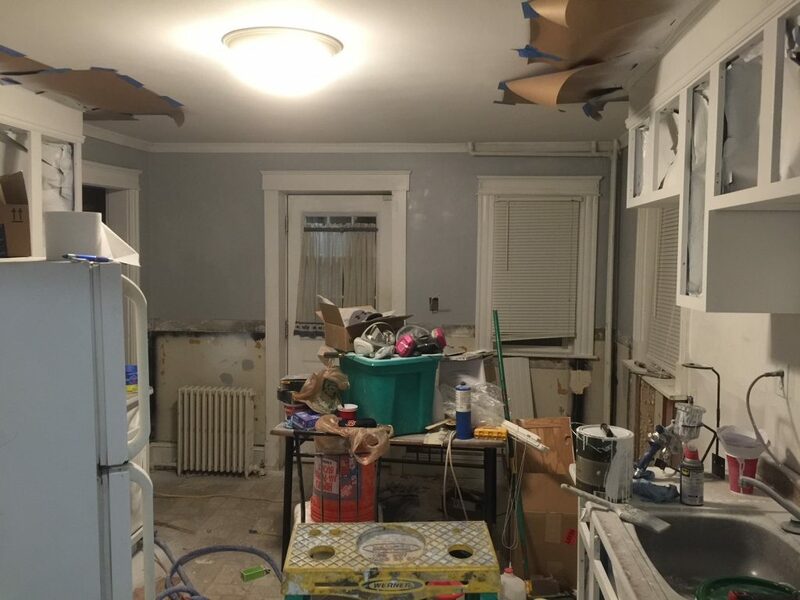 As luck would have it with these types of renovations, it always seems like once these properties get rented out, everything that COULD go wrong, DOES go wrong. Case in point…the 2nd floor bathroom was leaking down to the basement. After poking holes and snaking my camera snake through the walls, I eventually pinpointed the problem to be the sewage drain pipe which had a crack in it. Had to cut the pipe all the way down to the basement. And then there was the mess that was made during the replacement process. And the main drain pipe finally cut out. Needless to say, this was a setback that I had to get fixed. 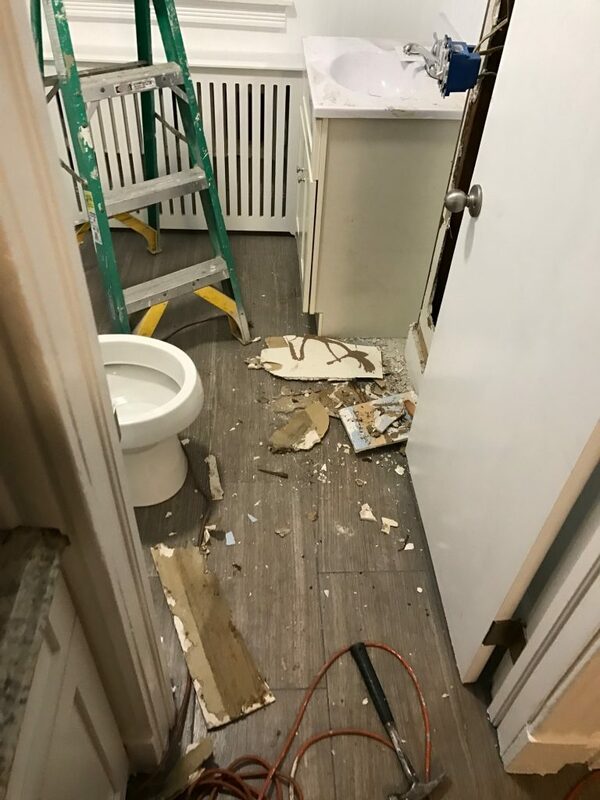 Fortunately, I got this fixed a month before the tenant moved in (at the time, this was a rental property, which, as of the date that this post has been published, is currently being sold). But that was an extremely painful experience to deal with. I am pretty terrible with updates to this website. 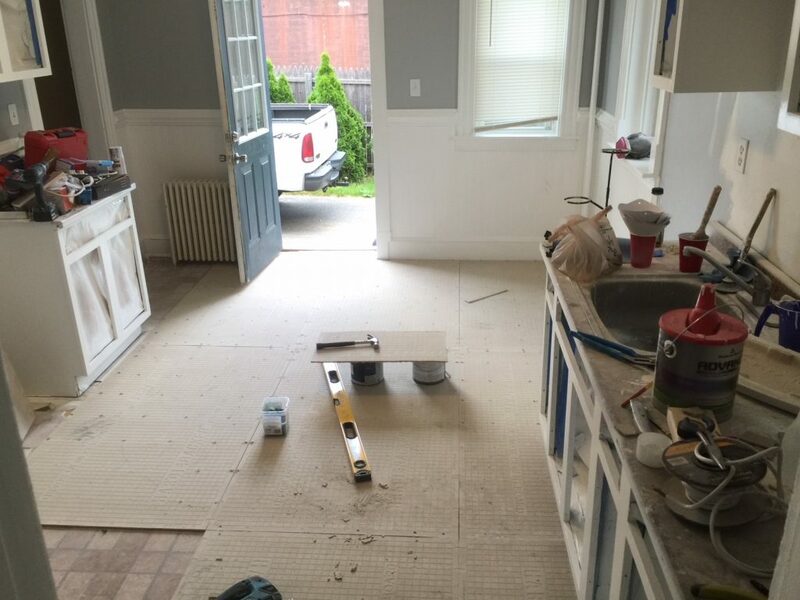 These past few months, I’ve been inundated with renovation work on a rental property, which I’m currently now selling. 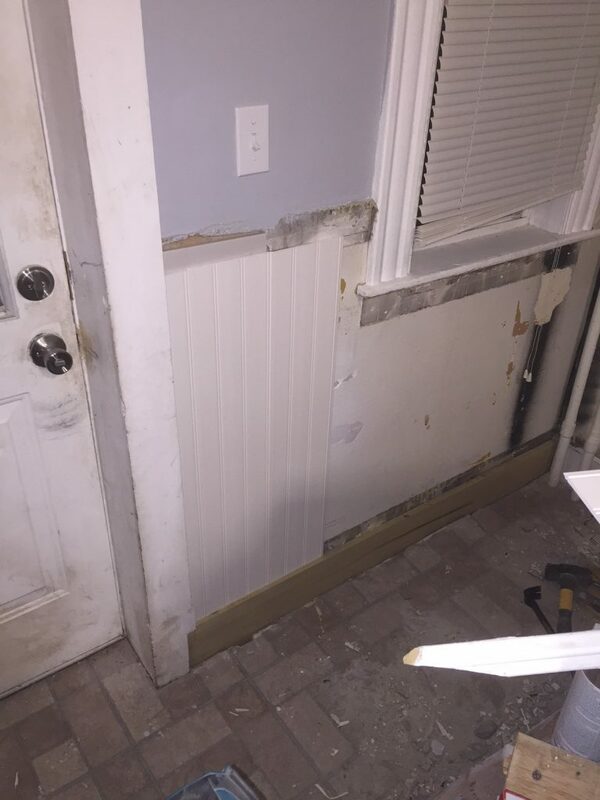 I figured I would also break this particular reno (my first reno!) into different parts. 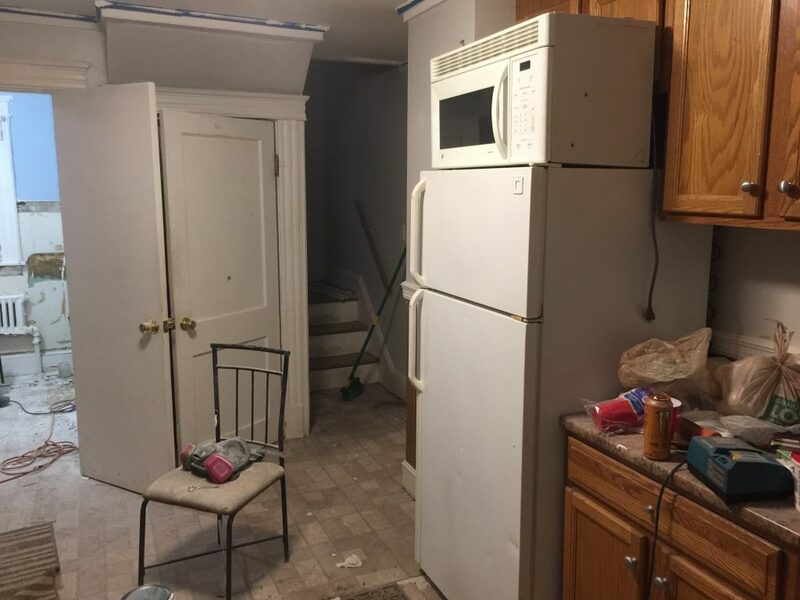 When I purchased the property, the kitchen looked pretty dated, as you can tell from the photos. 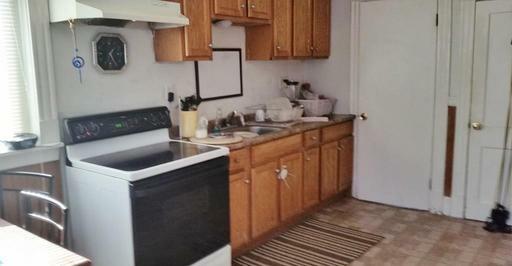 The cabinets were the crappy big box home improvement store-bought, which looked hideous. The recirculating exhaust vent was too far from the stove top to even be of any use at all. The paint on the walls were several different shades of white. The old wood wainscoting was caked with varnish/urethane/lint/dirt, and it was falling apart. The flooring was flaking in some spots, as it was one of those peel-and-stick type of linoleum flooring. The lighting was akin to a candle in a mason jar, as the dual-bulb halogens were complete garbagio. I had my work cut out for me. So I made a quick mess of the house once I got my tools in. I quickly turned the tiny nook table into a work bench. 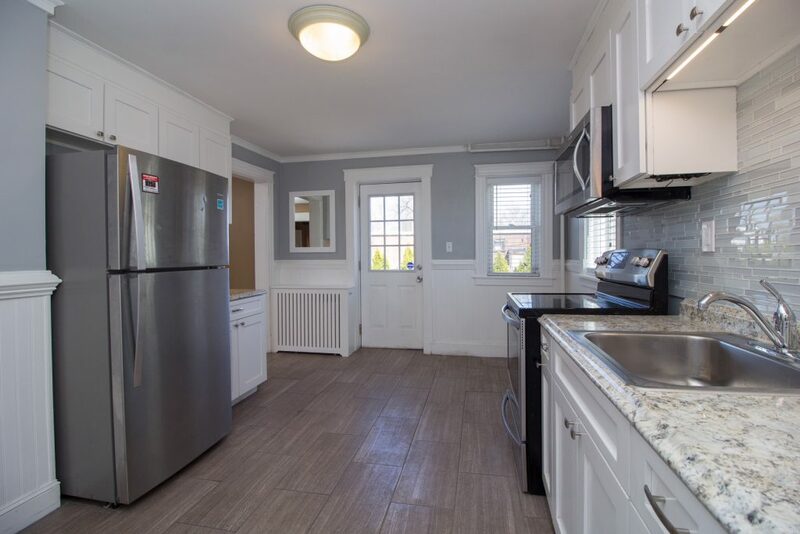 This is a photo from a different angle of the kitchen that I took, in case people were wondering about the microwave and fridge. After deliberating whether or not I wanted to replace all of the cabinets with brand new cabinets (which would’ve increased my costs on the project that I didn’t want to spend time doing), I decided to paint the existing face frames semi-gloss white, and replace the cabinet doors and drawer fronts with some custom shaker-style MDF ones that I could paint the same color. 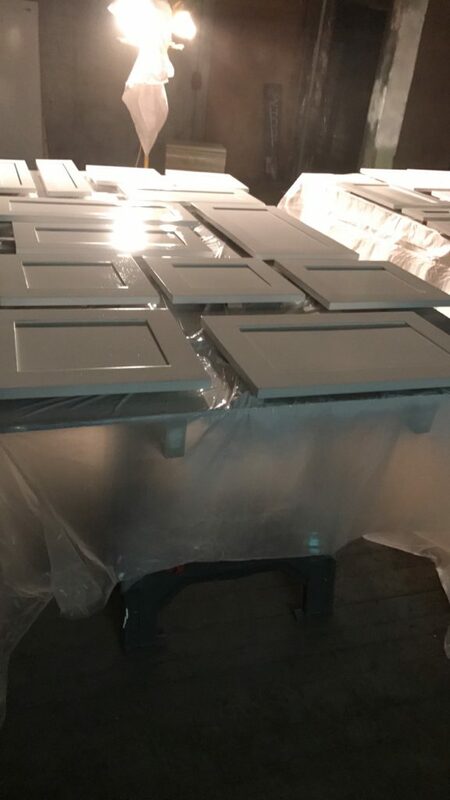 When I ordered the new cabinet doors and drawer fronts, there was a lead time of about 3 weeks. Because of that set back, I figured I’d start with prep and painting the face fronts. 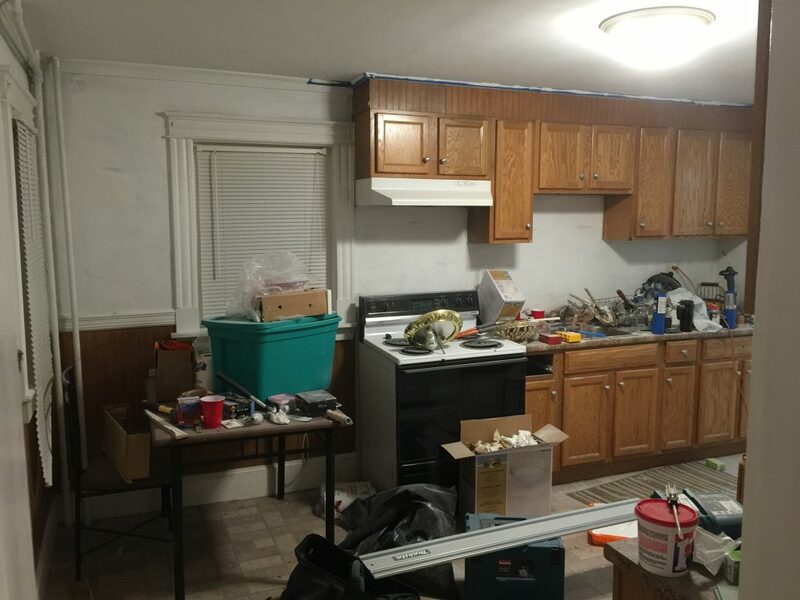 I removed all the cabinet doors and hinges off the cabinets, as well as the drawers. During the prep, and something I didn’t take photos of, was that I went over the entire face frame with wood putty and filled in the natural gaps of the oak veneer on the all the face frame surfaces. Prep work is pretty important when it comes to the final results coming out really nice. You want to sand and make sure your surface is clean before you start any painting. Prep work is almost always the longest process and the most boorish task, because you’re mostly sanding and waiting for compounds to dry. For the face frames, I use a Fuji HVLP spray system. I used some water-based primer to lay down a few coats of primer onto the face frames. After letting it dry, I sanded back some of the primer with high-grit (220) sanding pads to give me a super smooth finish. If there were any gaps or gouges that missed, I’ll use some wood putty, sand, primer, and then re-sand back down until everything was uniformly smooth. I did this for all the cabinets, on both sides of the kitchen. 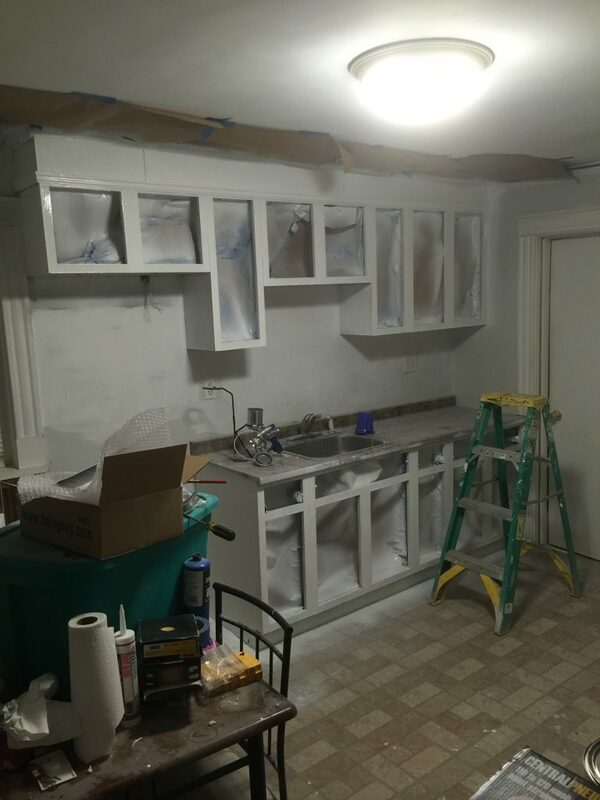 Note that I was only painting the face frames, so I covered the interiors of the cabinets so they wouldn’t get paint on them. 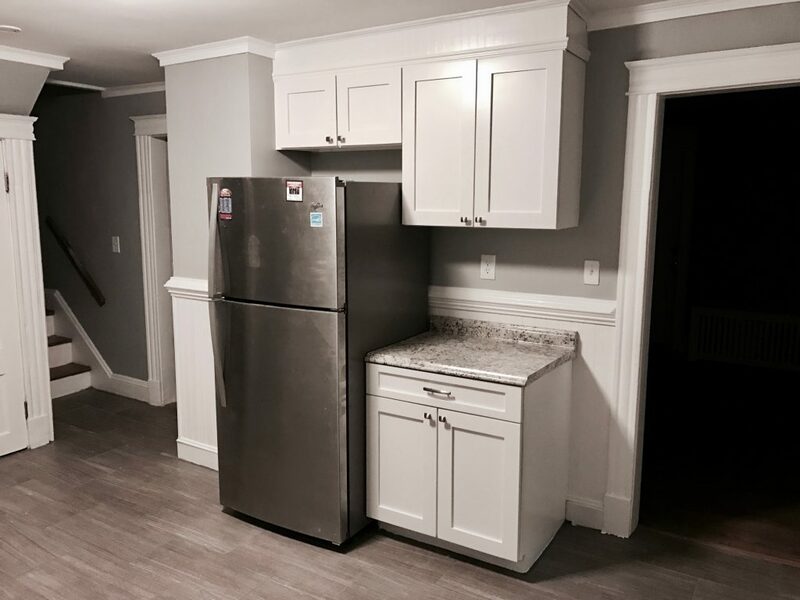 I could’ve painted the entire interior white as well, but I thought the wood interior of the cabinets would be a nice contrast when the doors were open. Here’s a close-up view of the semi-gloss paint that I sprayed onto the cabinets. This specific area had some orange-peel (notice how that the paint looks like the skin/peel of an orange), which I sanded down, cleaned, and resprayed. In this shot here, at a remote location, I painted all of the cabinets on some flat surfaces. Look at how that semi-gloss paint pops! Next up, painting the walls! I ended up painting the walls a medium gray, to give it that modern look. After getting all the top half of the walls painted, I decided to stick with wainscoting, instead of painting the walls all gray. 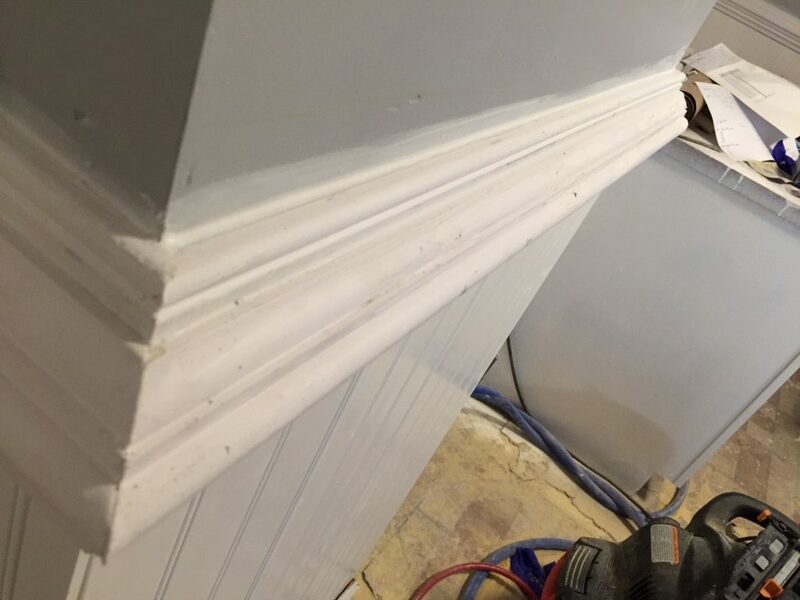 This mostly had to do with how the previous owner did the room, where the bottom half of all the walls in the room were recessed by about an 1/8 inch, the same thickness as the wainscoting panels. So since the room was pretty much dead-set on having wainscoting panels, I got some plastic/vinyl wainscoting panels, instead of the wainscoting made from hardboard. It was a bit more expensive, but considering the durability of the vinyl, and the fact that it was rot-resistant, I figured this was a safer choice at the end. Also, when I took apart the old wainscoting, I had damaged some of the base boards, so I had to replace them with some new ones. 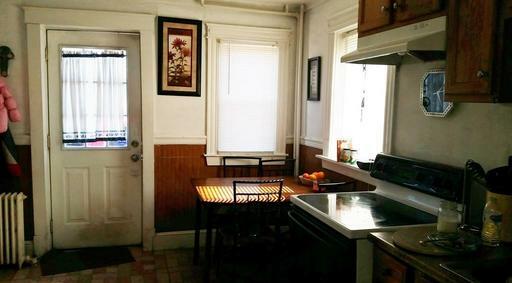 Nothing too crazy, hence why the photo on the left shows a bare wood baseboard. Pretty much continued this process all around the kitchen, using some paneling adhesive and brad nails. Next up was the chair rail installation process. Now the chair rail had to be done right. It had to be even ALL the way around the kitchen, otherwise someone would notice that the chair rail was crooked. 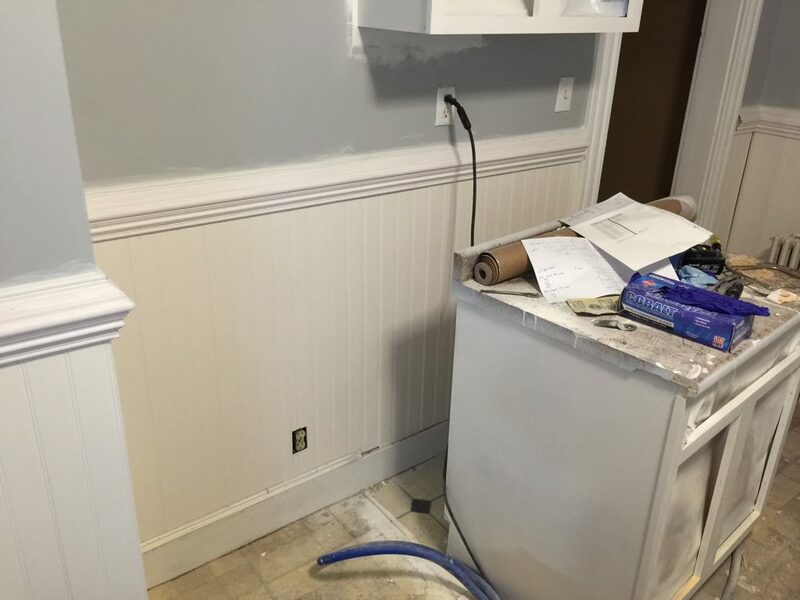 This posed another problem, because when I installed all of the wainscoting, I was assuming the baseboard were all even, and that would mean the kitchen floor was even all the way around. WRONG! 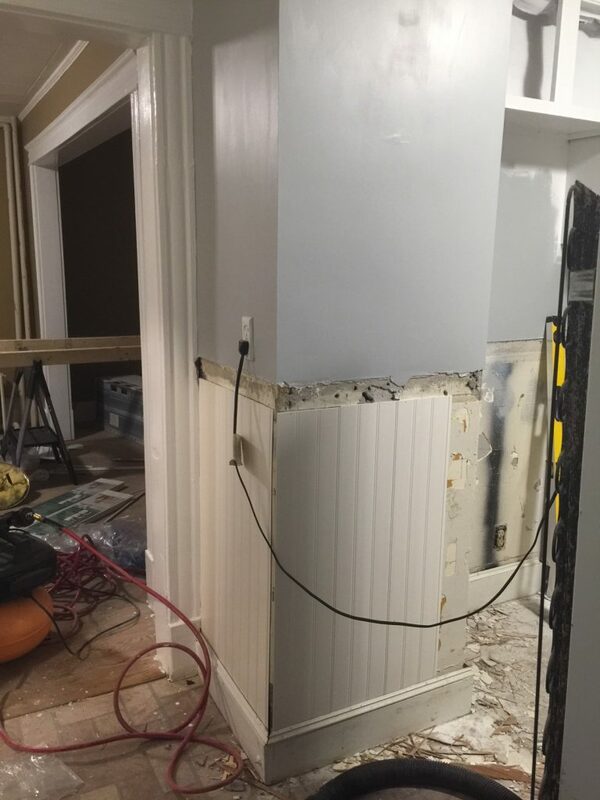 The wainscoting that I had just installed was not level all the way around! 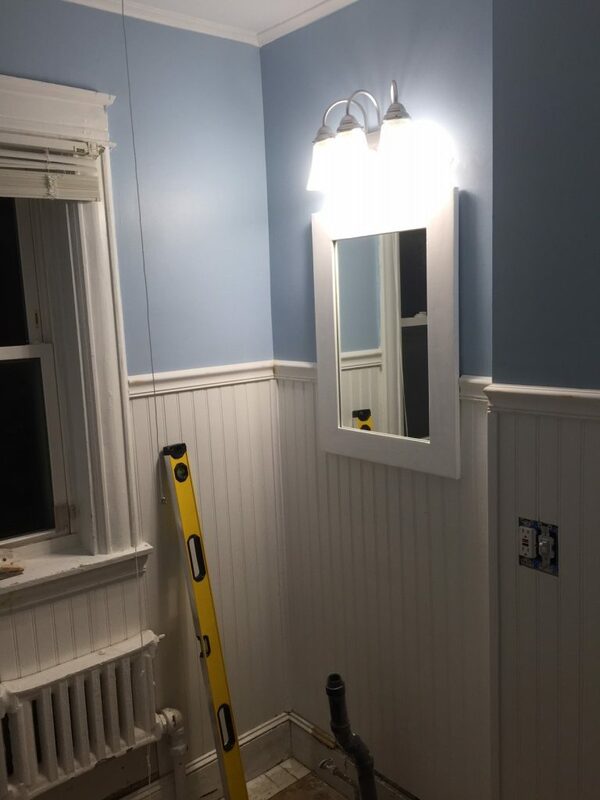 This posed a huge issue, because I was worried that the uneven wainscoting was going to require me to do more work to flush cut high spots. Fortunately, I found an easier solution: use a super tall chair rail molding! I think the chair rail molding I got was at least 4-1/2 inches tall, hence why they look so large and pronounced. Here’s more shots of the chair rail up close. Not only was it tall, but it stuck out about 2-3 inches! Ok, this section is going probably going to piss of the purist of the trade, but after 2 years since I installed the tiles, I’ve yet to have any sort of lippage or issues with the tiles. That being said, here’s what I did. Since the floors were originally linoleum, and the sub-floor felt dimensionally stable (there were no creaks or significant dips when I used a straight edge along the floor, we grabbed some backer board and special screws designed to be used with the backer board, and screwed each piece of backer board over the linoleum. I’ve seen most people pull the linoleum and scrape the glue off the sub-floor, which is time consuming and not necessary. 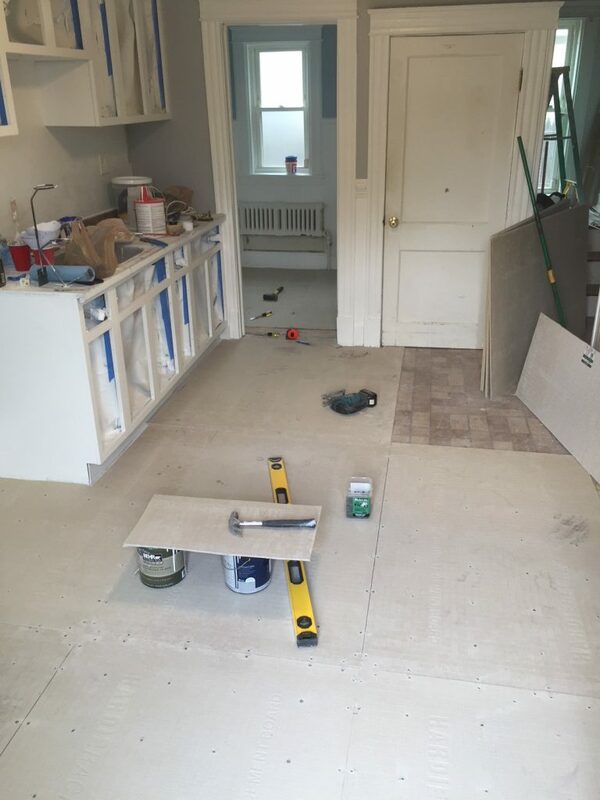 Linoleum doesn’t expand or contract like wood does, and since we were screwing the backer boards to the sub-floor, this was fine. The one thing I would’ve done differently, was probably stagger the backer boards. You can see in the photos that I pretty much lined them next to each other, which “they” say is something you should avoid because it can be considered a weak point. Again, this was done about 2 years ago, and in the final set of photos, you’ll notice that there have been no issues with the tiles whatsoever. But in future practices, I would stagger the backer boards. Some folks also suggest putting mortar between the backer board and subfloor, which I did not do. And as I’ve mentioned, I have had zero issues with the tiles thus far. I suspect that this could be an issue with smaller tiles. 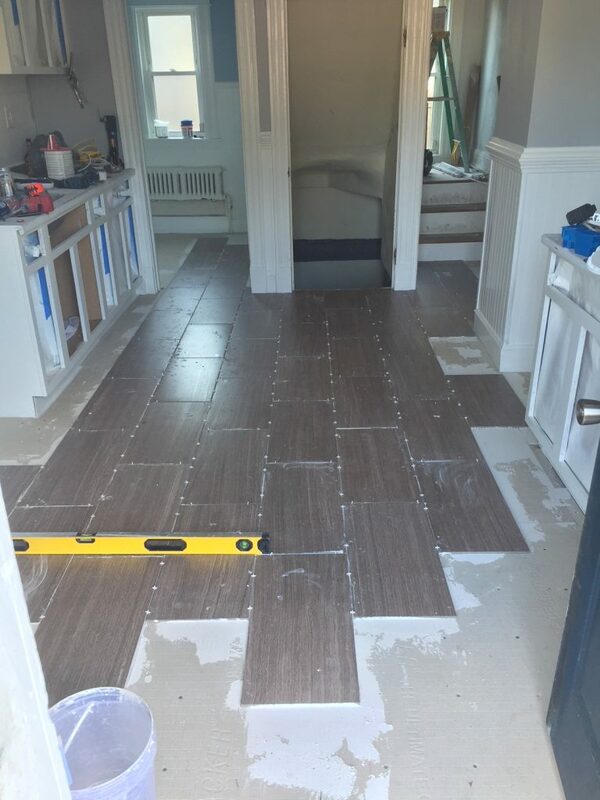 The photo below shows the staggered pattern I chose to go with with the 12 x 24 tiles (they have a little weight to them! )…sort of a semi-wood grain look (not really, but everyone seems to comment on that they look like that). Once I finished up the tiles and the grouting, I snagged some stainless appliances, had someone throw up the glass backsplash (mostly because I didn’t have the time anymore to do it), and tossed up some LED under-cabinet lighting. Also threw some nice window treatments as well, but what a transformation! Also replaced the old dated countertop with a nice looking stone laminate countertop and new stainless steel sink basin. I couldn’t justify spending beaucoup bucks on a granite countertop. And lastly, I covered up radiator by the doorway with an MDF radiator cover, that I had custom made. I felt like that it made the most sense to spend money on that instead of a granite countertop, especially after I threw a mirror above the radiator cover. 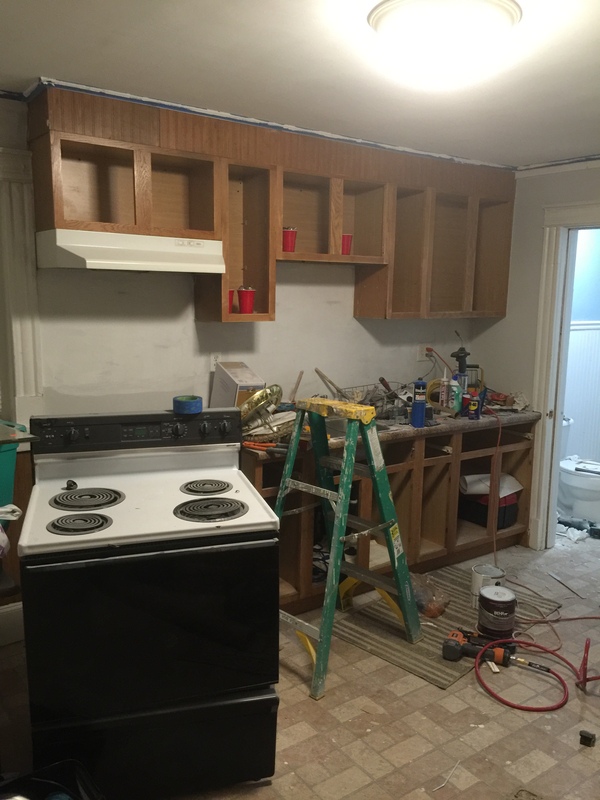 It felt like an extra counter top space that could be used up, and it would hide the ugly old radiator. 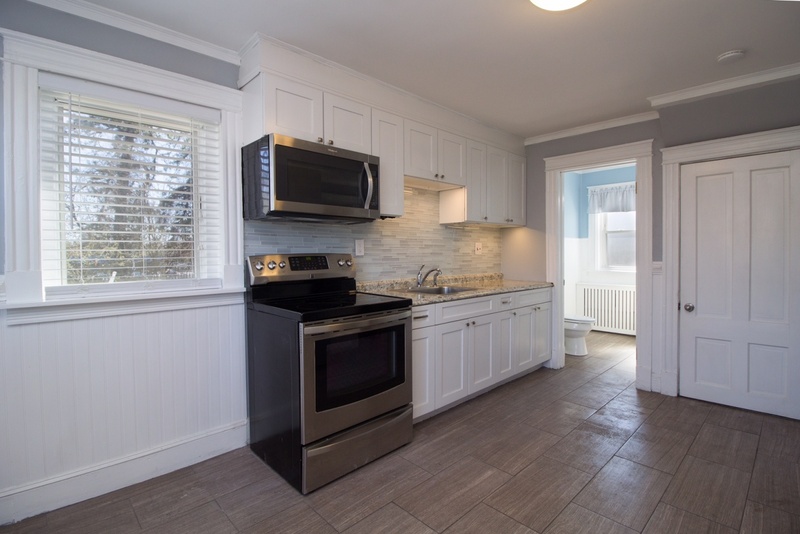 Overall, not too bad for my first reno and picking up all my skills on the fly and countless hours of watching YouTube reno channels to get ideas and to learn how to tackle the job to get the outcome I wanted. This was debatable as a “mod” or a “build.” I’d like to think of “builds” as constructing a piece of equipment from parts and scratch. 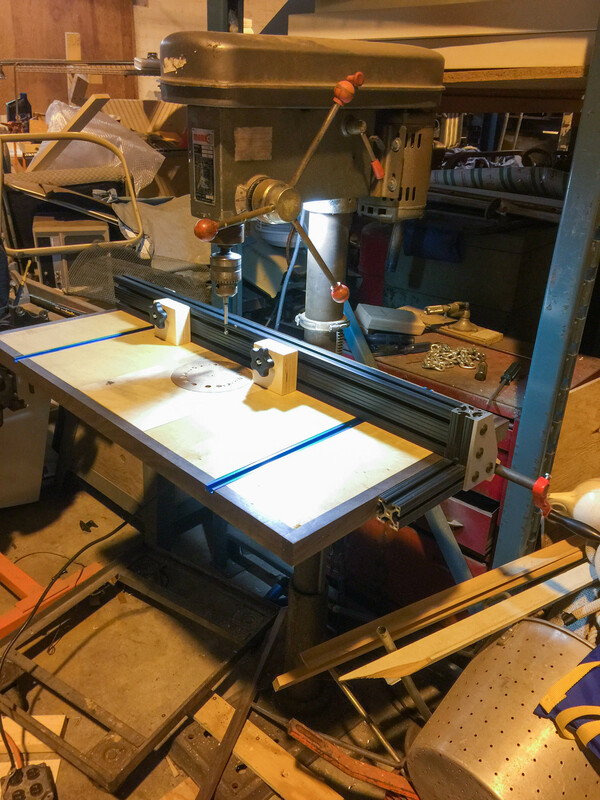 “Mods” are more modifying an existing tool to suit a better need, such as a large drill press table, reinforcing cheap tool cabinets. 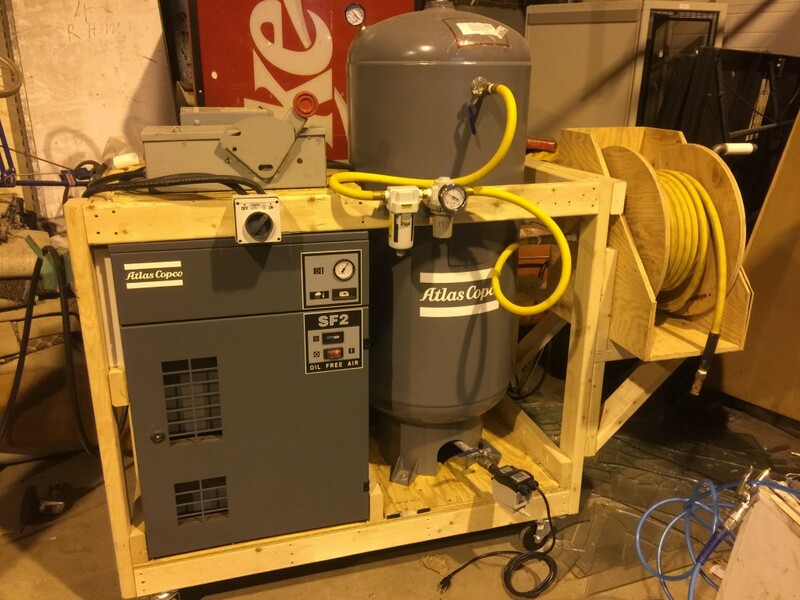 Whereas “builds” are complete projects that do not necessarily modify a tool or a piece of equipment directly, such as this case, where I built a mobile chassis for a large industrial air compressor unit. 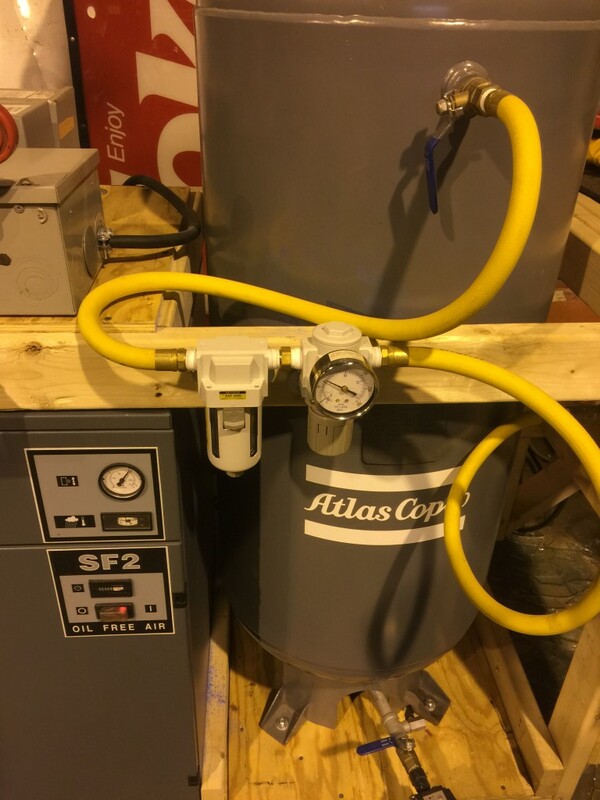 I managed to score an Atlas Copco SF2 from my buddy, GL. His company was literally about to throw a brand new air compressor, for the sake of getting rid of equipment! The downside, for most folks, is that this specific air compressor was a 3-phase compressor. Residential homes use single-phase. You rarely see a 3-phase home, since those are used commonly in commercial and industrial complexes. Now, mind you, when I got this off of GL, there were no cables, hoses, gauges, or regulators of any sort. No manuals or paperwork, except for an electrical schematic that I didn’t find until much later in the process. All that I got packed on the back of the truck was the compressor unit (the gray rectangular box), the tank, and the condensate pump (little unit on the bottom of the tank, in the image above). Fortunately, this is 2016. After looking up the appropriate support centers, calling a few numbers, and a couple of e-mails letter, I got a very detailed instruction manual on how to use this thing. In situations like this, when you’re offered very little information with unfamiliar equipment, it’s always good to do your due diligence in properly doing the research. And in this case, the proper thing to do is to RTFM (hint to what RTFM stands for…the R is for read and the M is for manual). Since I was already aware that the equipment uses a 3-phase power source, the question was what voltages are being supplied? There are 2 varieties of 3-phase power: wye (or “y”) and delta configurations (you can read up on all the goodies on the 2 types of configurations here). Since I’m located in North America (if you’re from other reaches of the world, it’s best to check your local standards), wye configurations are 120/208VAC. The 120/208VAC usually means that if you measure the AC voltage between two hot lines, they will measure at 208VAC; similarly, if you measured the voltage across a hot line and neutral, you would 120VAC. Delta configurations are pretty simple. They either come in a 208VAC or 240VAC flavors. There is a “high-leg” delta configuration, which is not your typical configuration, where you get 3 different voltages. 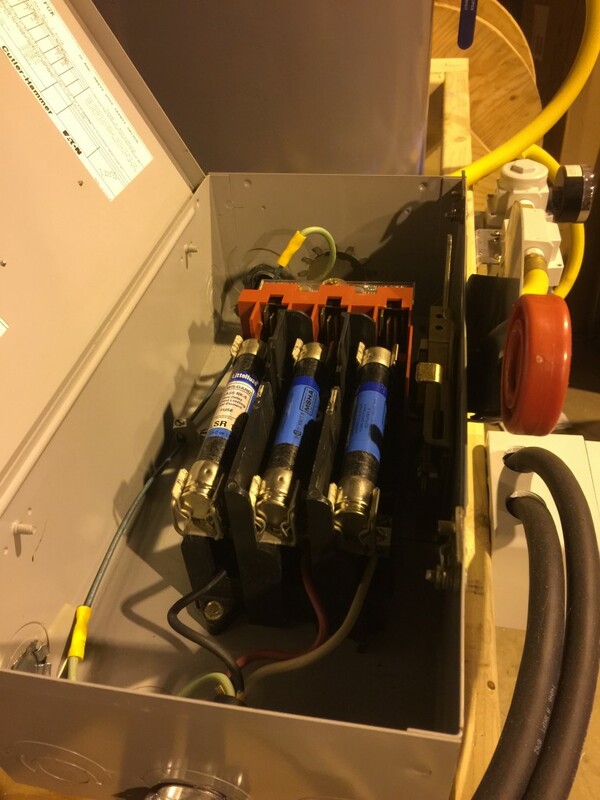 At the end of the day, it doesn’t exactly matter which type of configuration your 3-phase is set up for, but it does help identify how an electrician installed it. Knowing if you have a shared neutral and ground/earth connection will indicate a wye configuration, is definitely great for pulling any additional 120VAC lines. So once I checked the circuit breaker, I determined it was a wye configuration (120/208VAC). The problem was that I needed 3-phase 240VAC (delta configuration), per instruction manual. This was not good. Technically, you can run a compressor under-powered, but this wears out the life of the compressor motor, as the power demands require a higher current draw. This in turn means the motor runs hotter and eventually wear out. I found a transformer that would step-up the voltage appropriately. 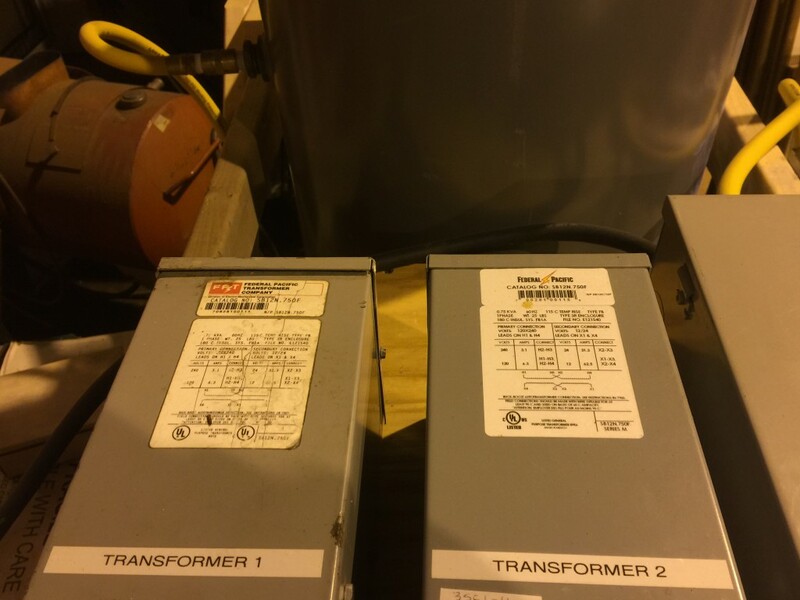 I snagged one used and one refurbed Federal Pacific transformers. I wanted something cheap, and didn’t result in putting a lot of unnecessary costs on boosting the voltage for the air compressor. Turns out I need two of these small transformers (the two totaled approximately $140 together) to boost the voltage from 208VAC to a nominal 230VAC, for the proper voltage to power the compressor. I got 230VAC from the good ol’ instruction manual. After solving the voltage supply issue, I looked into fuses and an isolating switch. The instruction manual specifically stated that fuses on each phase (hot wires) was required, as well as an isolating switch. I could have killed two birds with one stone by using the fused safety switch box (that large, gray rectangular box with a red knobbed lever that you see below), but I decided to add an extra isolating switch for the heck of it (the white/gray box to the right of the fused safety switch box with two sets of cables going into it). Again, I managed to snag some 15A fuses, fused safety switch box, and isolating switch off of good ol’ eBay, per usual. 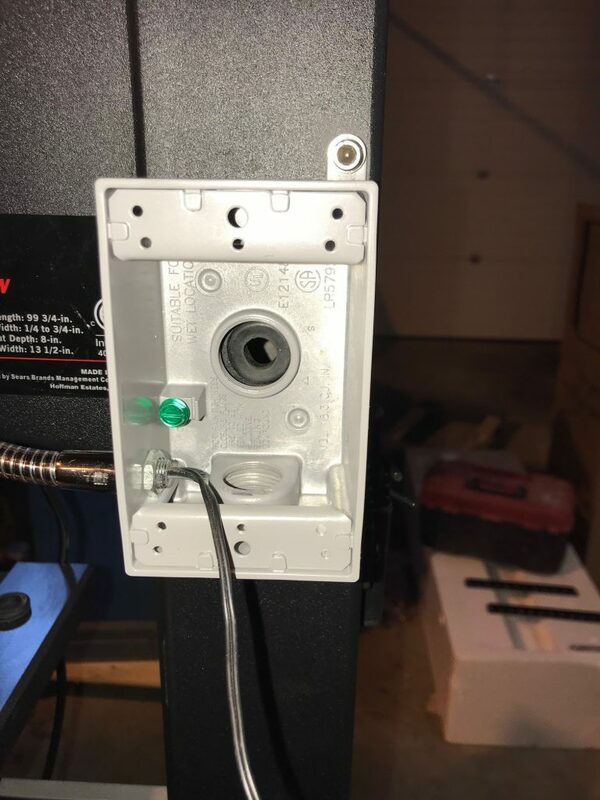 I’m not to worried with used parts when it comes to these types of electrical boxes and switches, with the exception of fuses (used, blown fuses are…well they defeat the purpose of what they’re used for, obviously). Air pressure regulator and air filter supply. After getting the majority of the bulk electrical hooked up, as well as hooking up the wiring connections for the 3 phase within the compressor unit, I decided to tackle the air supply out of the tank. I knew I wanted a pressure regulator and air filter supply. I did contemplate installing an oil reservoir, but I decided against it, since I had plans of using HVLP paint spray guns. It would be a bad idea to feed oil to the paint spray guns, as that would promote orange peel and surface paint quality issues on the final product that would receive the paint. However, it’s crucial to apply oil to all your air tools that are not HVLP spray guns! Ideally, for the air hosing, you would want to use the largest allowable hosing. I went with a 1/2″ diameter hosing, as this was the largest allowable size for the air tank. I snagged a couple of 3′ hosing, a 6′ hosing, and a 100′ length hose. I would later use a step-down hose, to a 1/4″ diameter, at the end of the 100-foot 1/2″ hosing, for flexibility. The reasoning behind this was that I wanted to maximize the length of hosing, in case I need to run long lines, due to the awkward location of the air compressor. A larger hose diameter would maximize this. This massive hose reel was a pretty sweet build. It took a bit of time to acquire some of the parts, since I couldn’t regularly find some of the parts at the local hardware store. These “specialty” parts include a 1/2″ swivel, a 1/2″ tee, and 1/2″ quick connect fittings. Most hardware stores carry a 1/4″ fitting instead, which is no es bueno. Ideally, you want to max out the hose diameter size, to maximize the distance that you can effectively provide the same from your pressure regulator to the output (i.e. HVLP paint gun or air nailer). That’s why you see a ton of thick 1/2″ yellow hosing. The concept behind the hose reel is pretty simple. 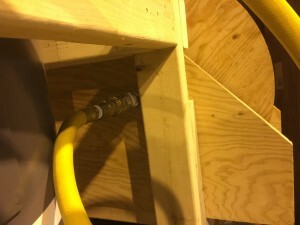 The swivel fitting goes from the yellow hosing, coming from the pressure regulator, to the piping in the hose reel. The special swivel fitting helps prevent the hosing from twisting on itself, or twisting off the galvanized pipe threads. 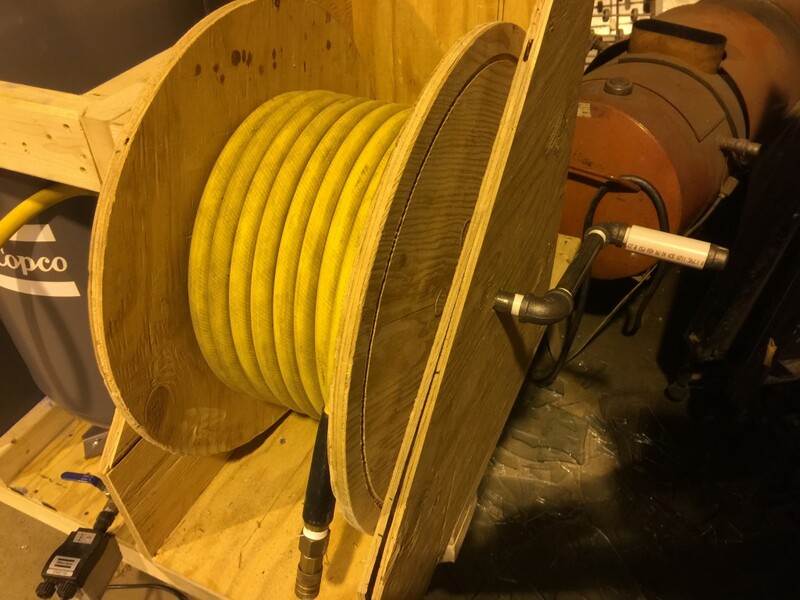 Within the hose reel, the line is split by the tee, and the handle is simply a set of straight pipe fittings mated with angle fittings, and capped at the end. Yes, the handle itself is pressurized. 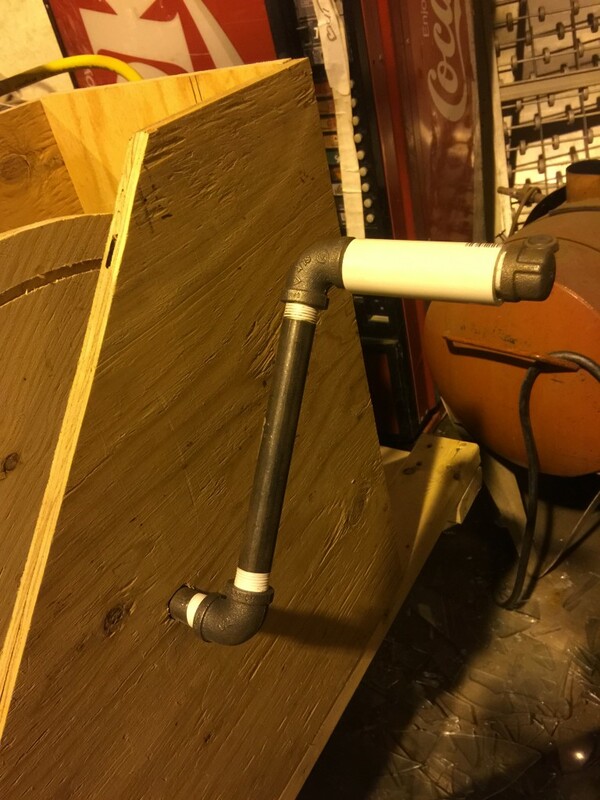 To avoid accidentally twisting the pipe off, I used a 1″ PVC pipe to act as a free-rotating sleeve over the 1/2″ galvanized pipe. All-in-all, this was a great build and having this brand new industrial compressor for free, and getting all the accessories and whatnot was pretty awesome. I figure if I ever did sell this in the future, the new owner can use my rig, and the ability to bypass my step-up conversion to their own delta 240VAC configuration. I know it has been a while since I’ve worked on the roller cabinet, but I’ve finally managed to find some time to finish the upgrades. So let’s get straight to the modifications! The stock Harbor Freight cabinet comes casters and hardware to attach the cabinet to the bottom of the cabinet. The bolts are threaded into rivet nuts on the inside of the cabinet. Those are the little gold cylindrical nuts on the inside of the cabinet on the image on the right. We won’t need those since we want to install some beefy aluminum channels to reinforce the floor of the cabinet. The method that I decided to with was to drill them out. You could effectively use a die grinder, but I didn’t have one around at the time. Drilling out the rivet nuts was a bit of a pain, insanely messy, and very tedious. After this was done, all that was left were some relatively over-sized holes (see the image below). One other issue that may not be apparent is that the sides of the cabinet, towards the back, have a square tubing that runs up the cabinet. 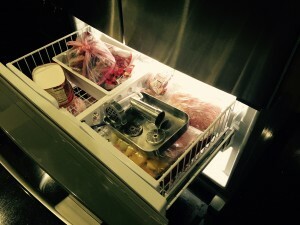 It offsets all of the drawer glides to be flush with the opening. 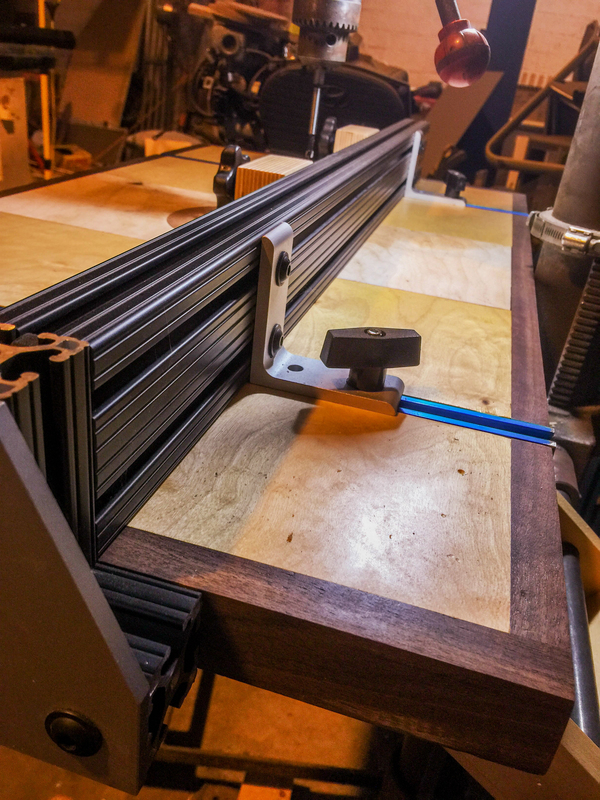 Not only is the tubing there to offset the drawer glides, but it provides some level of structural stability to the cabinet. I didn’t want to mess with cutting out clearance at the bottom for the aluminum channels. Instead, I decided to notch out the aluminum channels, to allow for the new set of bolts to attach to. This was mostly because the side walls on the aluminum channel material was rather thick, and if I didn’t notch out the sides, the holes would’ve been drilled into part of the channel walls. That would’ve been no es bueno! My next dilemma was to determine a way to notch out the 6061 aluminum. The ideal way to notch out the side wall of the channels is with a large milling machine. Unfortunately, I don’t have one of these fancy machines, but I do have a plunge router. My insane idea was to use a 1/2″ diameter end mill bit to route away the aluminum. My large Makita plunge router can accept up to 1/2″ shanks, so that’s why I went with the 1/2″ end mill bit. Once I determined that I was going to use my plunge router, I also decided that I wanted to keep the cuts clean. I didn’t want to freehand the cut. I decied to purchase an acceptable router bushing guide kit for my router model. Once I sorted that out, I wanted to have the router bushing follow some straight edges. So I jointed the edges of some walnut planks I had lying around. Walnut, being a piece of hardwood, was my go to choice. I would’ve gone with hard maple, but I had long planks of that material and I didn’t want to waste them by cutting them up for this quick exercise. I used the jointed walnut planks as parallel guides, and with the correct bushing attached to the router, I could follow the edges of the walnut planks. 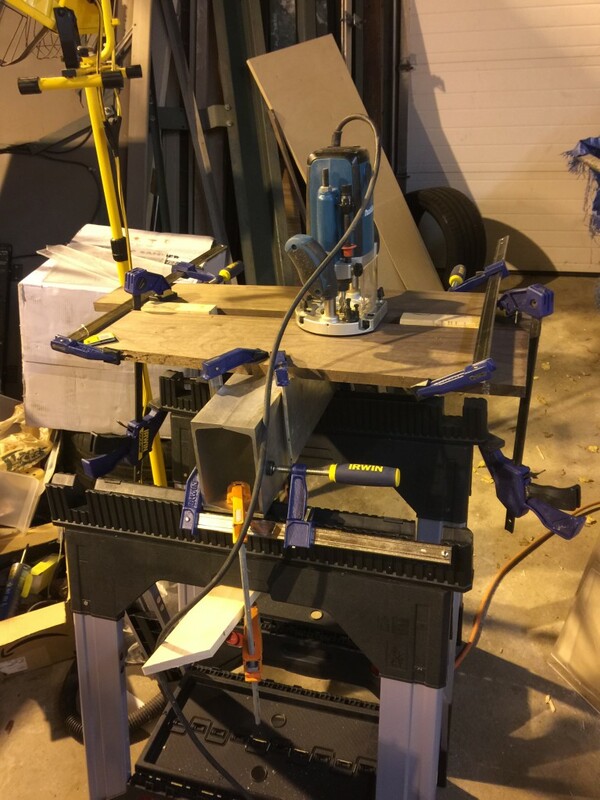 As you can see to the image on the left, I had my set up on some medium duty saw horses, and I went crazy with the clamps! 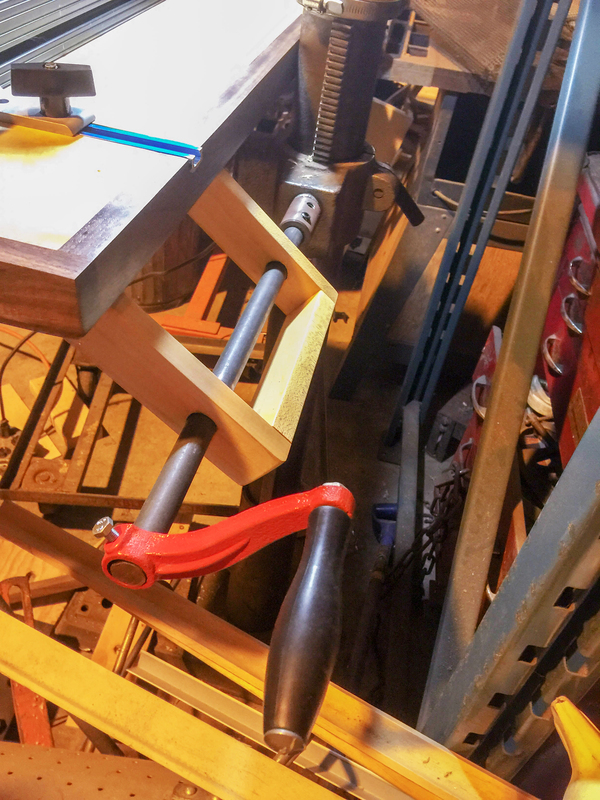 As a woodworker, you really can’t have too many clamps. I made sure that the aluminum channels were facing each other, and made sure I used screw-type clamps. The trigger-type clamps don’t have a strong enough grip than the clamps that have a screw handle. The reason why I made sure the aluminum channels were facing each other, was because I had indicated on the bottom of the aluminum channels the amount of material I needed to notch out. One of the key things to this setup was that I made sure the work piece was clamped to the saw horses (I didn’t want the work piece to rock side-to-side when the weight of the router was resting to one side of the walnut guide set up), and I made sure the walnut planks had appropriate spacers and clamps hold the planks to the work material AND the saw horses. In the image below, you can see how I used the walnut planks as parallel guides that I use the bushing on the router to follow. The best way to route the aluminum is to take very, very, VERY shallow passes, and to set the RPM low. 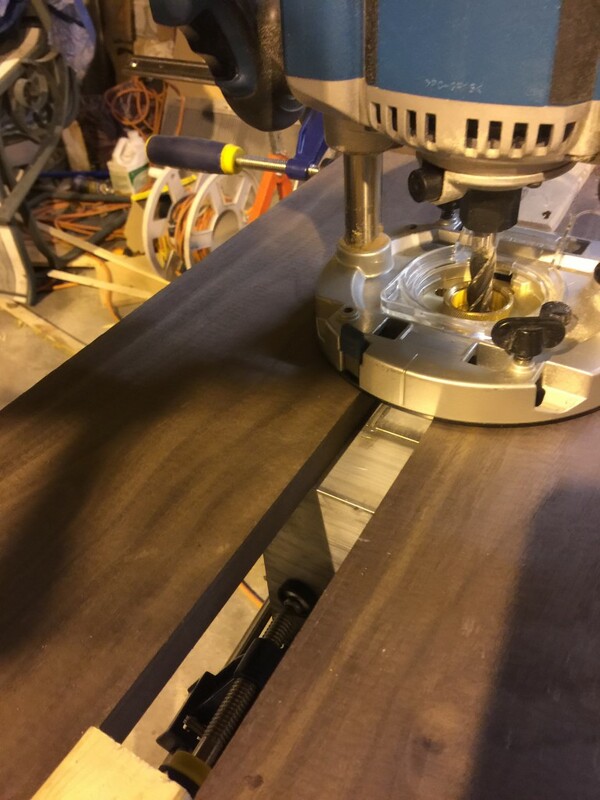 A plunge router is the best way to make these types of passes, although a standard router could work as well, because the notched cuts are from end-to-end. 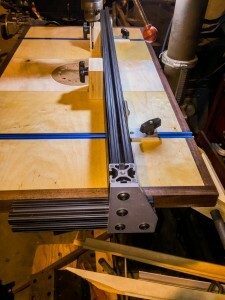 If we were to start the routing in the middle of the work piece, a plunge router would be the idea tool-of-choice. As you can see below, I screwed up the very first pass by not moving the router at a consistent speed. That’s why you can see the swirling bit marks that were left behind. This was the very first time I was attempting this, so you can’t fault me for doing some trial and error. I also went too deep at first. Shallow cuts are the key! I wasn’t worried about the finish at the moment, since this was the first shallow pass of many to come. But eventually, I got to the final depth and the finish came out great after I got a good feel for the setup. I did a bit of sanding with an orbital disc sander, to smooth out any jagged burl or sharp edges. So what’s this nonsense about the notches that I keep talking about? Well, on the right, you can see the test fit of the piece I made. 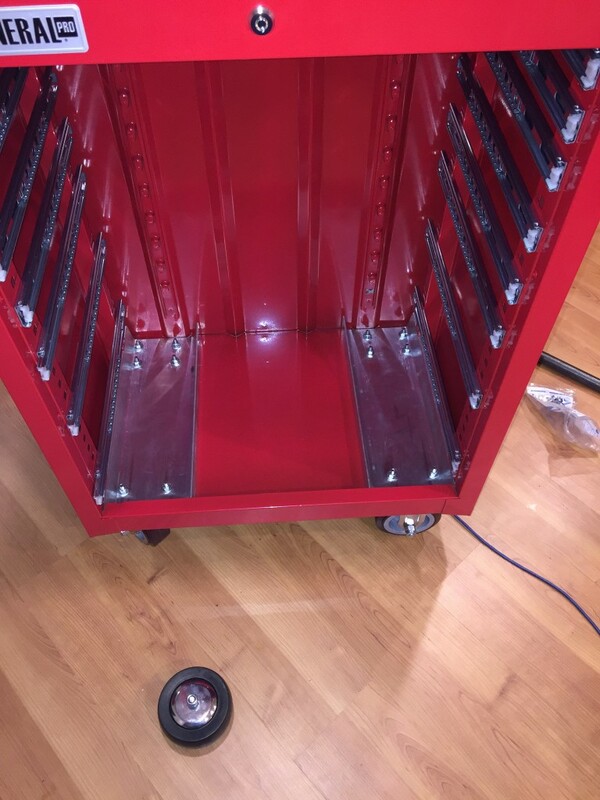 I wanted to set the aluminum channels to the sides of the roller cabinet as much as I could, without taking too much material off. This allows for clearance for the washers, nuts and bolts that I’ll be using to attach the casters to this new reinforced structure! What I did was I made a ton of measurements as to where this new hole would be. I had made a mock up template on a piece of hardboard (sorry, I didn’t take a picture of it!). Once I was sure the test template would fit and make clearance for the hardware, I went straight to the aluminum channels. I had the bottom facing up, and used some black sharpie to indicate where the holes for the casters would roughly be. 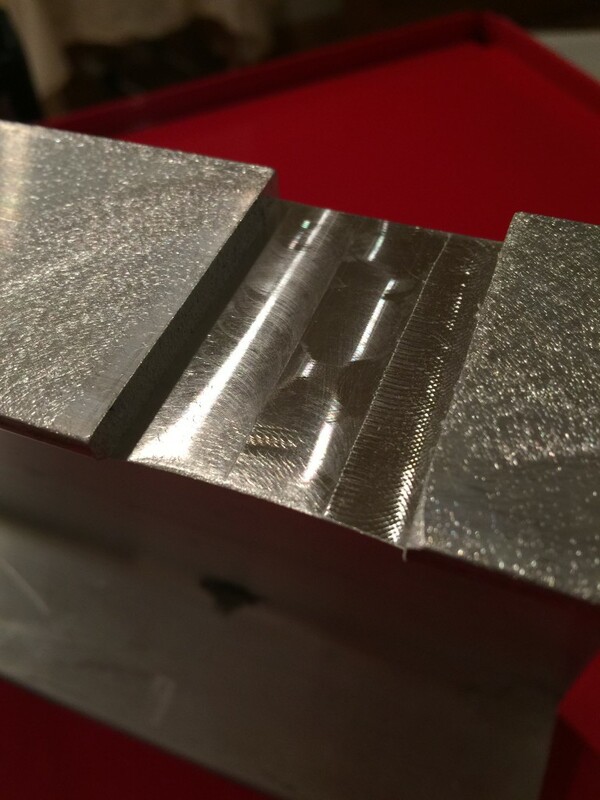 Using a caliper, I made some score marks, which you faintly see on the aluminum channel, below. The black sharpie dots that I made can be used as a surface “dye” to allow for making marks to indicate where to cut or drill. Machinists use Dykem to do the same thing, but I don’t have any so the black sharpie works just as well! Sidenote: I think one of the greatest things about doing some of these types of projects is that you don’t need expensive equipment to build what you need. Sure, I’m not using cost-effective hand tools to cut and drill the aluminum, but I’m also not using expensive milling machines or drill presses (although I do have a drill press, but it’s currently in a freezing cold workshop that has no heat). Back to the project. Since I’m using a cordless drill to drill these holes, I wanted to make sure that the drill bit didn’t “wander” on the work piece. 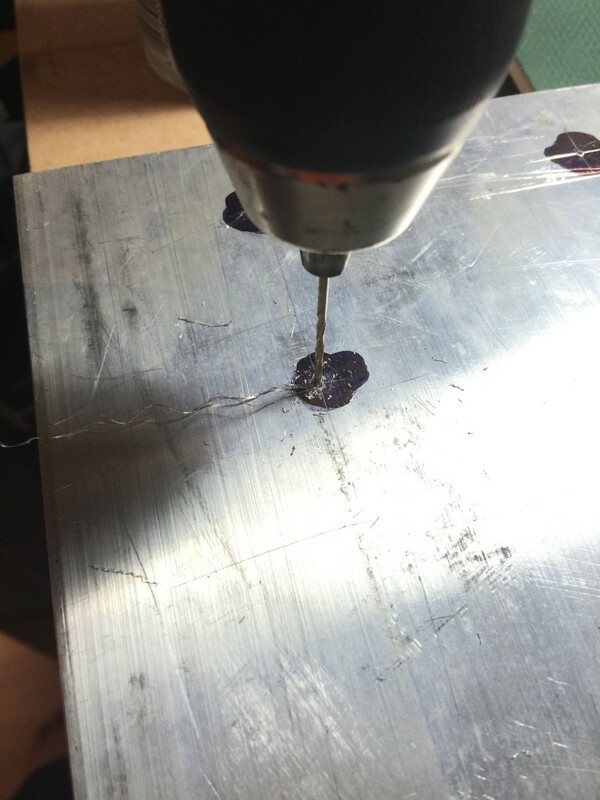 Because the work piece is made out of aluminum, you’ll want to create little divots on the work surface where you are planning to drill your holes. In comes the center punch! Probably the greatest tool when you plan on drill holes through any surface. It creates a great starting surfacing for pilot holes. Once I center punched each location of where I wanted the holes to be, I used my smallest drill bit to drill the pilot holes. I find this the best solution at the end of the day, because the pilot holes create a small hole to allow you to align your larger drill bits with. 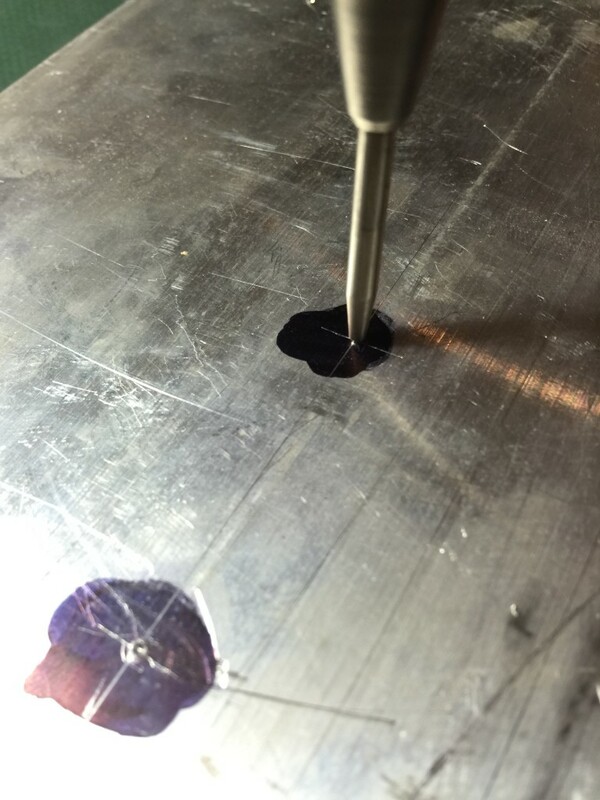 It also allows your drill bit to follow the path of the hole. As long as the pilot hole was created perfectly perpendicular to the work piece, then your final hole sizes will be straight! As you can see below, I drilled out pilot holes for each hole location. I didn’t manage to to take any pictures of the 3/8″ diameter final hole sizes, but you get the point (haha! Get it? The point…drill bits? Points?…whatever….). Before I went any further, I decided to work on the casters. Back on Part I, I had purchased some Moldon polyurethene wheels. Just the wheels were replaced, because the bolt pattern on the casters were funky and atypical of the normal casters on the market. The part number for the wheels is 5.00005.925. I would suggest that you order these wheels from a brick-and-mortar industrial equipment store, as they usually cover shipping costs. I purchased these from a vendor that I found online, and I had to pay for shipping, making these wheels a lot more expensive than I’d like ($44 for 4 wheels, but shipping jacked the overall cost to $64). 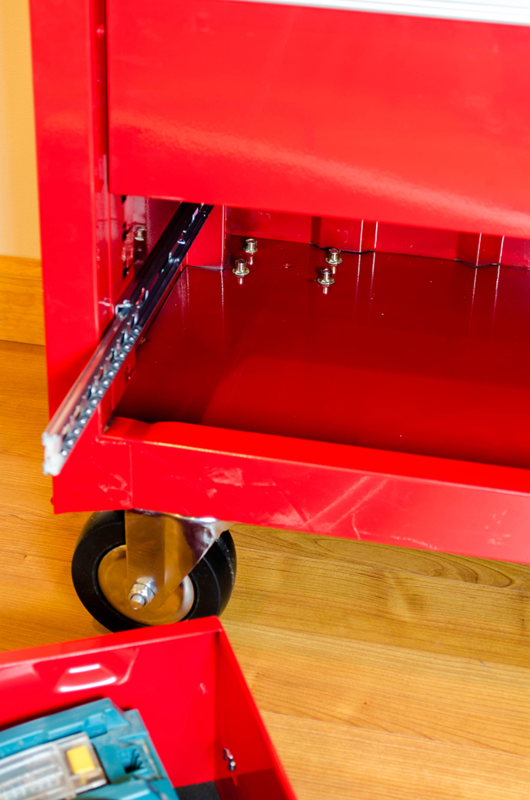 It sports a pedestal precision ball bearing (PPBB), which really reduces the noise when rolling the cart around. They say there’s no maintenance involved, but they do have a grease fitting on them which is a huge plus, for any future maintenance. These wheels are capable of up to 750lbs each, so they can handle over a ton and a half of weight. We aren’t using these bad boys on a light weight sports car, so they’ll be more than enough to handle the weight of the tool cart! 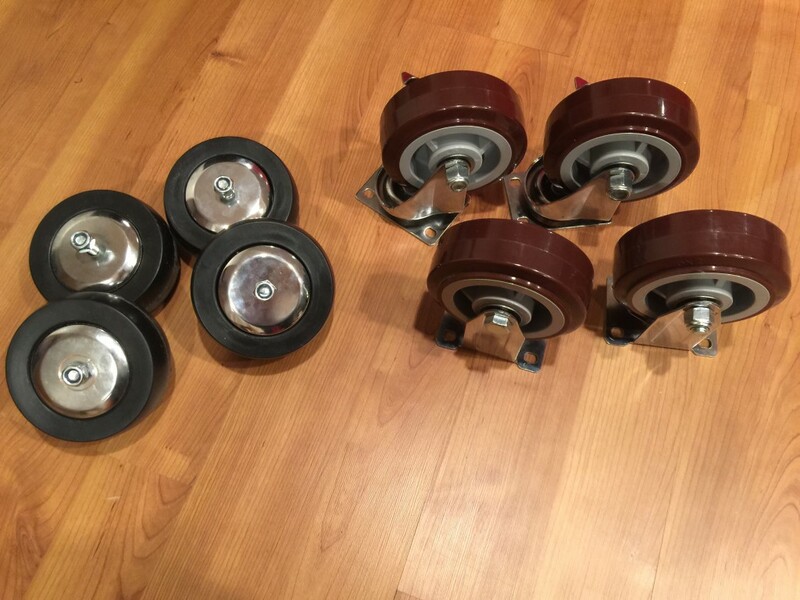 I made sure they were the same diameter as the 5″ stock caster wheels, because I wanted the old hardware to work with the new wheels (specifically the spinning casters that had the lock on it!). I had to purchase a 1/2″ drill bit, since my drill bit kit maxed out at 3/8″. I went with a 1/2″ drill bit because I had to upgrade the nut and bolt for the caster axles to a 1/2″ bolt. The stock nut and bolts for the axles of the old wheels were too small. I drilled out the the caster frames where the new bolt axle would fit, as well as the cam and stopper pieces on the spinning casters. Caution to those that do this…were some long sleeves and mechanics gloves, because hot metal shavings that fly onto your bare arms and hands tend to hurt a bit. I ain’t chicken, but they were definitely unpleasant. You can see the final product below. 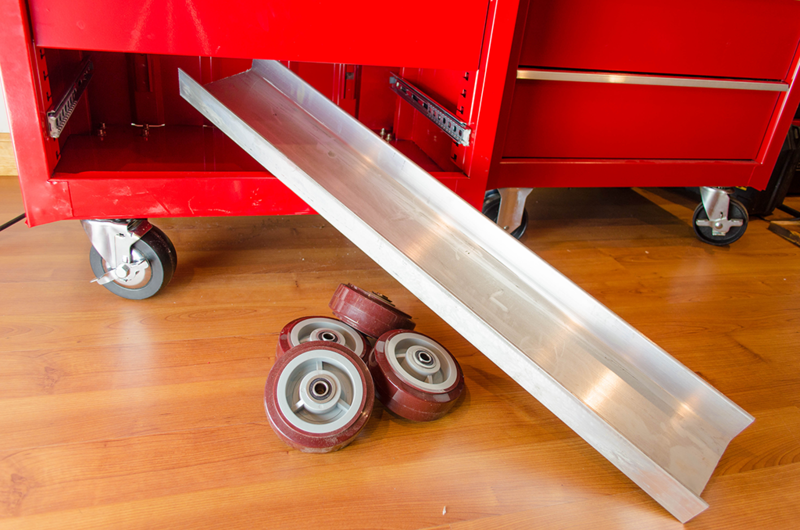 I fitted the aluminum channels into the bottom of the roller cabinet, and tested with a finished caster wheel assembly. With one bolt in, I made sure that I had clearance for all of the other bolts to attach the finished casters with. I was really lucky that I didn’t screw up any of the hole locations on the aluminum channels for the casters. The hole locations on the aluminum channels were spot on. They say you should measure at least 37 times before cutting once. Come to think of it, I think I made one measurement on my template, drilled some holes, and checked the template fitment. 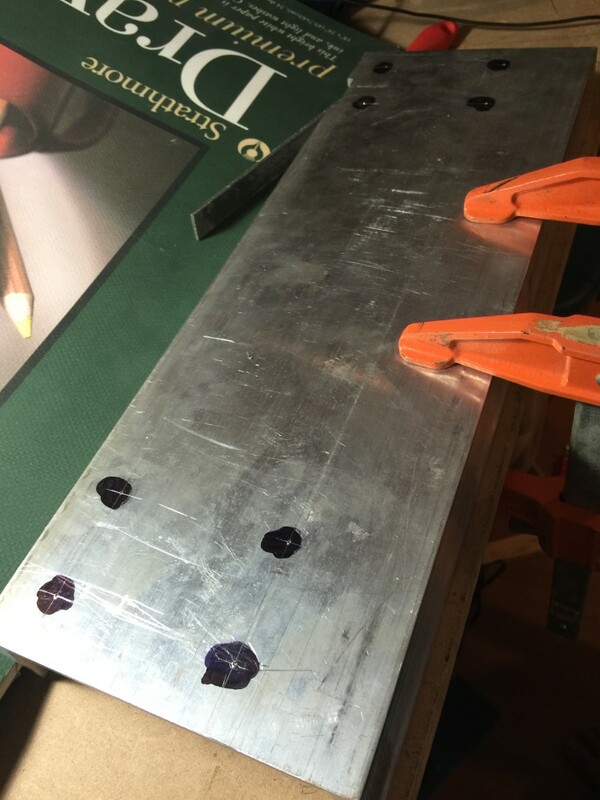 Once I saw the fitment was good, I didn’t really measure anything afterwards on the final aluminum pieces…other than copying my dimensions that I had written down on the hardboard template. I mean…I technically didn’t measure it. But in practice, you should measure a few times before making your final drilling/cuts. You can also see the clearance issue I was referring to earlier in this article/build/posting. 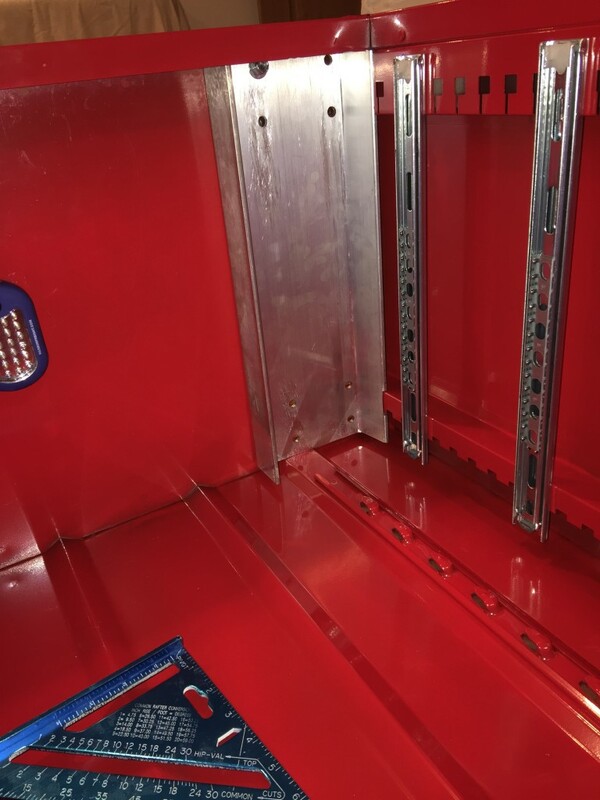 For all of the nuts and bolts that are towards the sides of the roller cabinet, I had to notch out the aluminum a bit to allow for that clearance. Even with the notches, the clearance was still a bit close, but it was enough of a clearance to fit a washer and nut on the each bolt on each caster. Mission success in my book! I did a test on the whole roller cabinet, after putting all of the drawers and top drawer unit back on. The entire roller cabinet was very stiff and solid. There was a very slight sway when I pushed the entire assembly from the top, but I suspect that it was most likely from the drawers being relatively empty. Once I load up the drawers with my tools, I highly doubt there would be any sway whatsoever! Another awesome thing was that the new wheels are completely quiet and it glided so smoothly along the floor. I was really shocked at how smooth these wheels were! Was the wheel upgrade really necessary? Not really. The stock wheels are ok for the job. But these wheels really put a smile on my face when I’m moving the cart around. Effortless and quiet. I’m a fan of mobile equipment and having these wheels move so easily and quietly was very satisfying. I’ve provided a breakdown of the overall costs to the rolling tool cabinet. Overall, I spent about $472 on this tool cabinet, which is still considerably cheaper than multi-drawer cabinets on the market. Don’t let the low price fool you, though! The drawer glides and construction of each drawer is VERY solid. 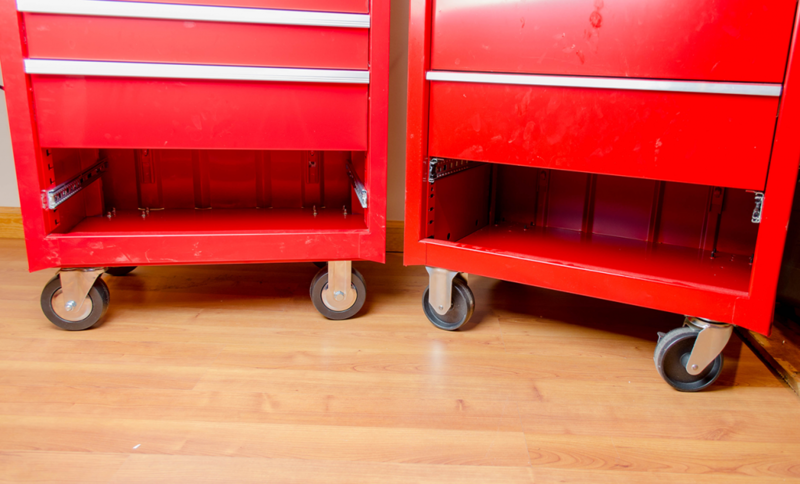 These are chunky and heavy duty, and with a bit of modifications to the casters and structural integrity of the floor pan of the cabinet, I dare anyone to find a smooth, quiet, effortless tool cart for less than that price (with the same number of drawers, or more, for a 26-inch cabinet)! 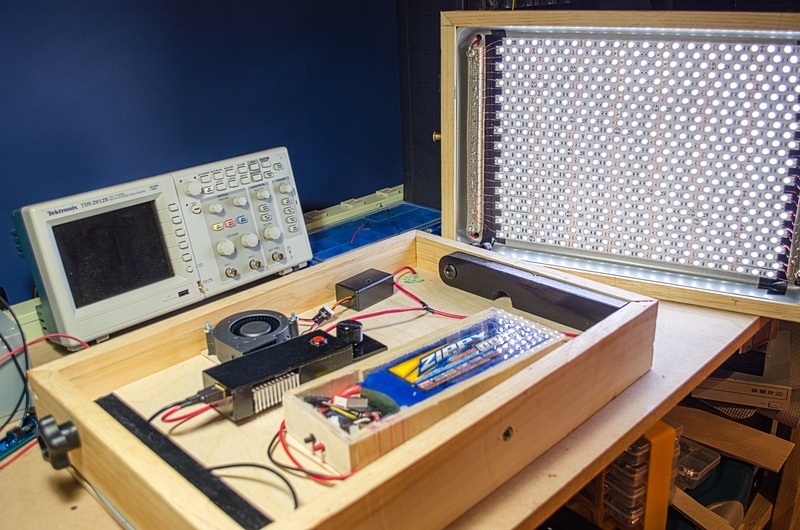 For Part 2, I’ll be going over the aspects of the lithium polymer (or LiPo for short) battery setup that I’m using for portable setups (such as the LED light panels), sans AC power. 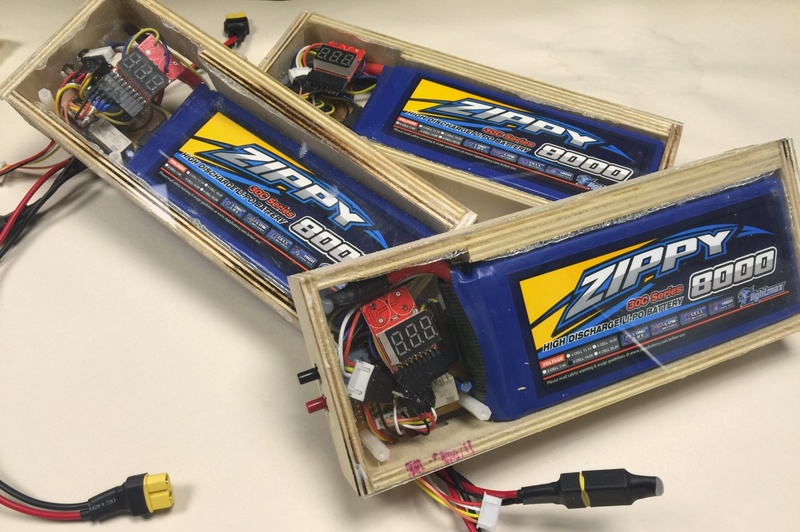 LiPo battery were used in this project, specifically for their long-life spans and price points. The reason why LiPo batteries are so popular is that if you properly maintain them, they can be recharged several times without degrading the battery over time. I won’t go over the basics of LiPo batteries (a Google search will yield a lot more information). Instead, I’ll be focusing on the basics of the specific type of LiPo I used within these projects. 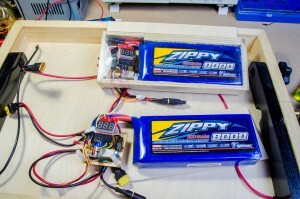 I snagged a few ZIPPY Flightmax 8000mAh 4S1P 30C off HobbyKing. If you happen to find a comparable brand, that’s fine. As long as it’s a 4 cell LiPo battery, rated for at least 8000mAh. If you’re curious about learning more about the battery terminologies, such as 4S1P, you can go here and play around with the settings on the Script Asylum website. A 4S1P battery is essentially for 4 battery cells in series (hence the 4S). A 4S2P battery would be 2 parallel (hence the 2P) connections of the 4 battery cells in series. I personally wasn’t interested in the 2P versions. Although they do yield slightly more current capacity (8400mAh vs 8000mAh), I prefer the 4S1P for its low profile and weight factors. One could hook up a LiPo positive and negative terminals directly to their equipment or circuit, but the problem with that is the stock LiPo batteries don’t have a battery protection circuit. A battery protection is a must-have to prevent over-discharging the battery below a nominal voltage level. Discharging a battery past its nominal voltage will damage the LiPo battery. A cheap LiPo battery alarm can be used, as a quick solution to alert users when one of the cells have dropped below a preset voltage. However, a better solution would be to create a circuit that automatically shuts off power from the LiPo battery when one of the cells have dropped below a voltage level. 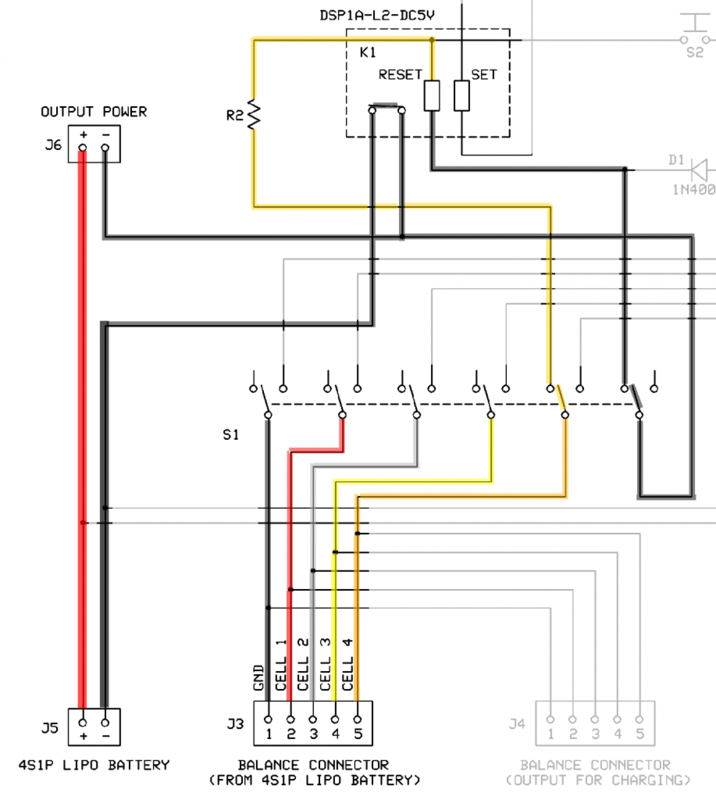 Matt from DIY Perks has a great, basic circuit layout that I used as a stepping stone to work off of. 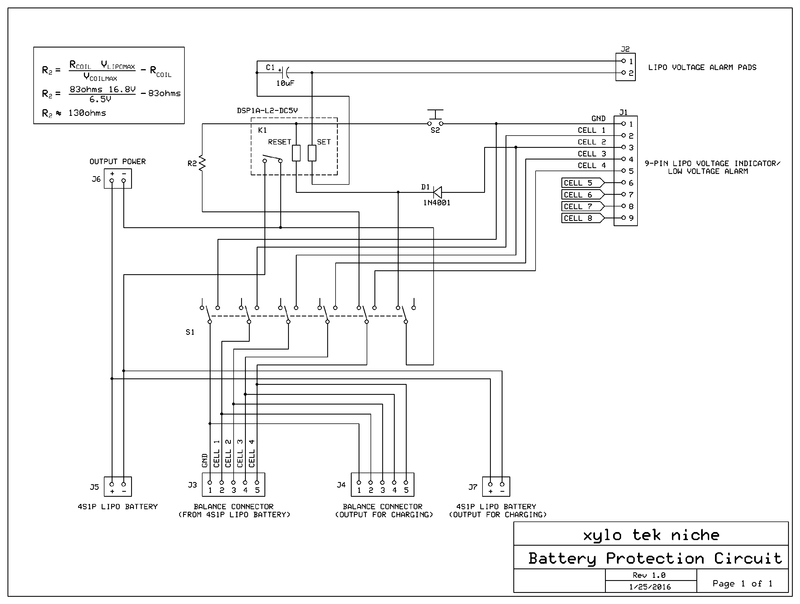 The image below is my version of circuit diagram that I’ve adapted from DIY Perks, to fit the 4S1P LiPo batteries. The first step is to purchase a bunch of cheap LiPo battery alarms. The more, the better, because I have noticed that the voltage read outs on these may be off by 0.2-0.5 V, which may be a big deal if you’re discharging the battery down to as close to the recommended minimum level of power (around 3.2V/cell). To weed out the alarms with poor voltage read outs, I HIGHLY recommend measuring the voltages of each cell off the balance connector. I used a digital multimeter to check the voltage between the 1st (black) and 2nd wire of the balance connector. This is the 1st cell. Then I checked the 2nd and 3rd wire. This is the 2nd cell. So on and so forth. Record what the values are for each cell. For instance, the voltages may be 3.8V, 3.81V, 3.79V, and 3.82V for 1st, 2nd, 3rd, and 4th cells, respectively. 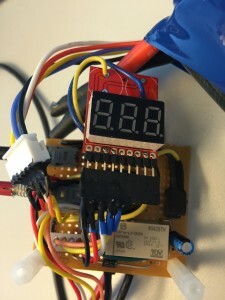 Next, attach the LiPo balance connector to the LiPo battery alarm, as shown below. The seven-segment displays will display the voltage read out. Make sure, as the display cycles through all the cells, that the values roughly match up to what was recorded. 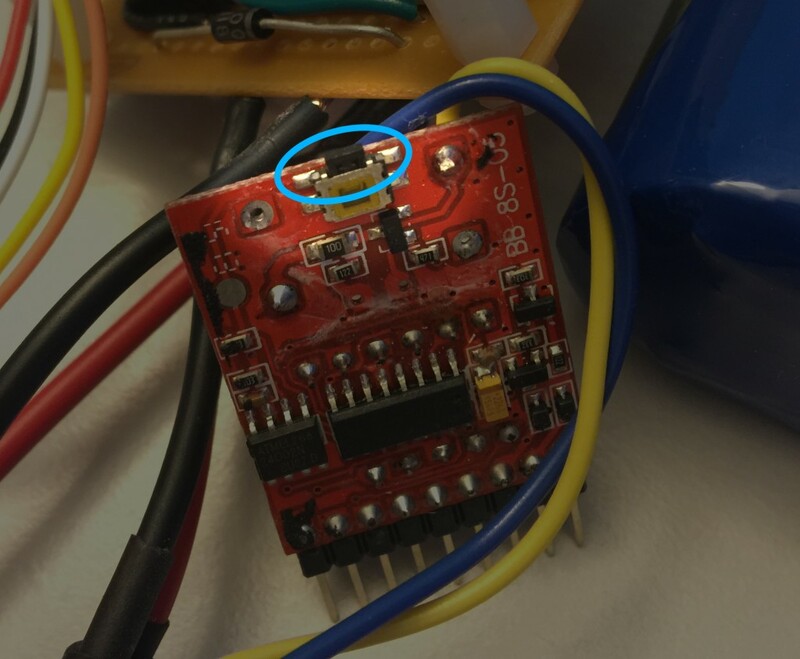 The image below shows how you should connector your balance connector to the LiPo battery alarm. Once you’ve weeded out the LiPo battery alarms that are way out of range from what you recorded, it’s time hack these good alarms. You can click here to check out the step-by-step that DIY Perks has out on his channel on dismantling the alarm speakers from the battery alarm testers. Once the two black alarms are removed, I attached a couple of pigtails to the top left and bottom right solder pads (see left image). These represent the +5V and ground to set off a dual latching relay. On the schematic I provided above (see Figure Alpha), J1 and J2 are both connections made from the LiPo battery alarm to the battery protection circuit (see the zoomed in picture on the right). Since these LiPo battery alarms are so dirt cheap, it makes more sense to grab these off-the-shelf parts and modify them to our needs. 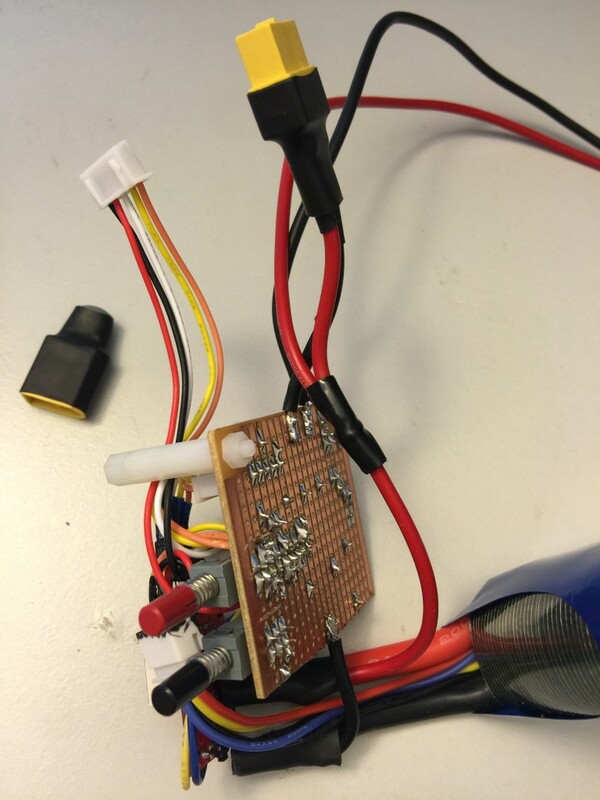 As shown on the right, the yellow and blue wires off the top of the LiPo battery alarm will go to a relay. I made a small connector to connect between the 9-pins on the LiPo battery alarm to the rest of the circuit. I spliced the connections on the LiPo battery and balance connector, since the ones from the battery were going straight to the board. As explained in the DIY Perks video, this allows us charge the battery, without have to remove it from the circuit, every time when we charge the battery. It’s a bit extra work, but well worth the effort. As you can see on the image on the left, the LiPo battery leads were shortened significantly to fit inside the battery case. To do this properly, without shorting the leads of the battery, make sure you work on one wire at a time. Whatever you do, DO NOT cut the positive and negative wires simultaneously! You will end up arcing whatever metallic cutting implement you are using, most likely damaging the tool and yourself. Instead, work on one battery lead wire at a time. I suggest working on the negative lead first. Shorten it, and then solder a wire from the lead to the board. Use shrink wrap and hot glue to “cap off” the end of the exposed wire. Then move onto the positive wire. The XT-60 connector I used, at the top of the left image, was the female connector. I decided to provide some protection to those terminals by using the end of a male connector, and putting shrink wrap and hot glue around the solderable end. This provides a protective “cap” on the exposed terminal. 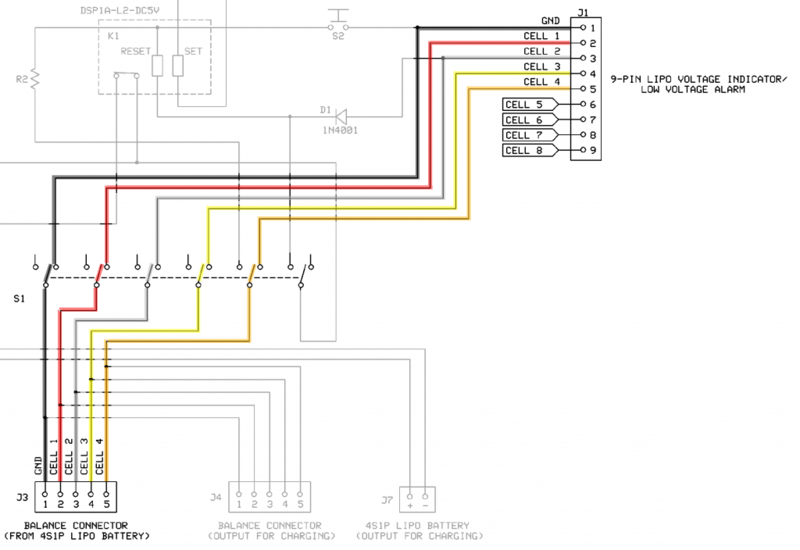 The crazy 6 pole switch (S1 on the schematic), or the technical term, 6PDT latching switch. 6PDT stands for 6-pole, double throw, meaning there are 6 set of “switches” and 2 throws, or connections that the switch can make contact with. The latching switch is a switch that can stay continuously stay on when pressed, or completely off when pressed again. This is the basis of a light switch or power button. In this case, the 6-pole switch acts as the power-on button. Below, I’ve shown what happens when the 6PDT latching switch is “on”. 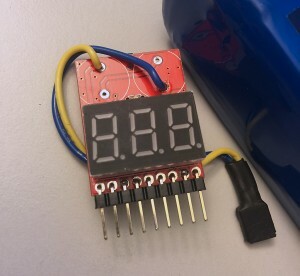 The circuit between balance connector and the 9-pin LiPo voltage indicator/low voltage alarm is completed, turning on the LiPo battery alarm. At this point, you should the seven segment displays cycling through each cell, displaying the voltage of each cell, as well as the overall voltage. 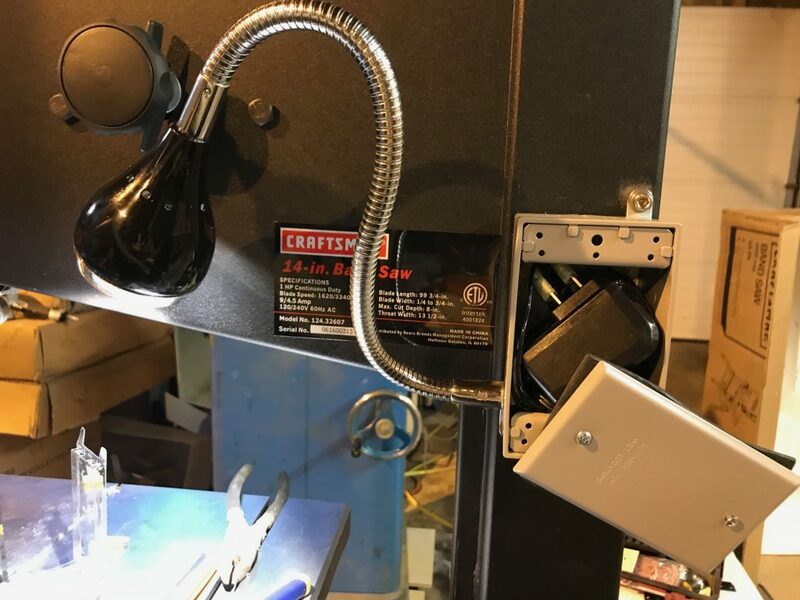 Likewise, when the 6PDT latching switch is “off”, then you break the path between the balance connector and LiPo battery alarm, which effectively turns off the LiPo battery alarm. Without the relay circuit, the 6PDT latching switch only turns on the LiPo battery alarm. You could wire the LiPo battery’s positive terminal to a switch, and forget about adding the relay circuit. 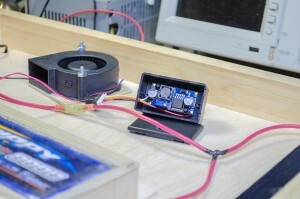 But you would still have to monitor the LiPo battery alarm, making sure that the battery doesn’t drop below 3.2V/cell. And you would have that switch on the LiPo battery itself, which is inconvenient, especially if you end up forgetting to turn off the battery. And if you end up leaving the battery hooked up to your circuit, draining the battery well past the 3.2V/cell minimum, then you’ve ruined your LiPo battery pack. This is where the relay circuit shines. The work done previously in removing the alarm speakers on the LiPo battery alarm will also pay off in the relay circuit. As the 6PDT latching switch is turned “on”, the relay doesn’t get set, because of the momentary switch (S2 on the schematic). S2 is a normally-open (NO), momentary switch which only closes the circuit for as long as the switch is pressed. Once you let go of the switch, the circuit is broken, which opens the circuit again. The specific relay chosen was a Panasonic DSP1A-L2-DC5V. It’s a dual coil, latching relay. A lot of relays require constant power applied to the coils on the relay, to either keep a circuit open or closed. This type of relay doesn’t require that, and that’s why we use a momentary switch to energize the coil. As shown below, when S2 momentarily closes the circuit, the reset coil on the relay is energized. D1 is a diode that drops the voltage from Cell 2, from approximately 7V to a manageable 6V (it takes 5V to energize the coils on either the reset or set coil). When the reset coil becomes energized, the open switch in the relay will close the circuit, which allows for the negative terminal on the output power to power your electronics. When you release your finger off the S2 switch, the relay will continue to latch (thus, keeping our electronics powered), unless the 6PDT latching switch shuts off power, or our LiPo battery alarm triggers the set coil on the relay. Manually shutting off power to battery pack. This can be done by switching our 6PDT latching switch, to “off”. To release the contacts within the relay, voltage across the relay coil may be applied in reverse. This is where the cleverness of the S1 switch comes in (I have to say that it’s pretty genius of Matt, from DIY Perks, to come up with this!). The last set of “throws” on the 6PDT latching switch, has its pole wired to ground, off one end of the relay contacts. This should be the opposite relay contact of the LiPo battery ground, since we don’t want to continuously draw power off the battery. So what happens here is that we use the line off the very last cell of the balance connector (in this case, cell 4) and the battery ground to reverse the voltage across the reset coil on the dual coil relay. Remember how when we turned on the LiPo battery alarm, via 6PDT latching switch, and pushed down on the momentary switch (S2) to allow current to flow from the bottom to the top of the reset coil of the relay? 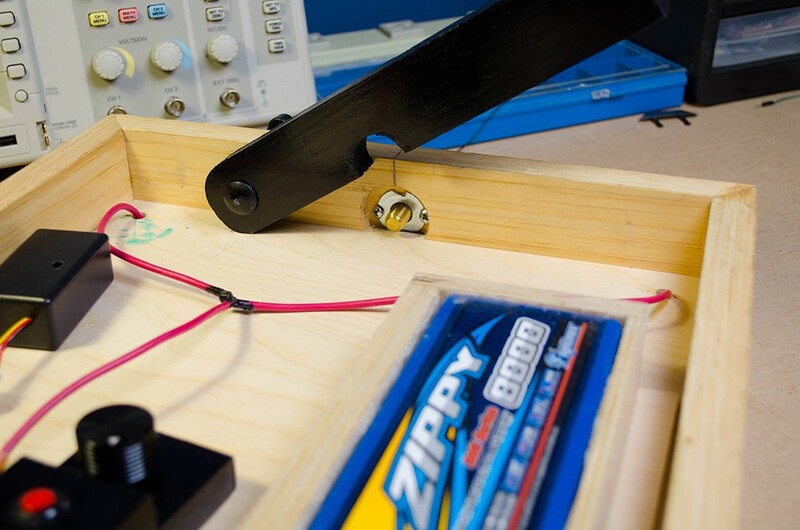 Now we are simply reversing the voltage across the coil, allowing the current to move in the opposite direction. However, we cannot just apply power from the last cell of the balance connector. A resistor is required to step the voltage down to 5V from nominal 14.8V off the 5th pin (last cell) of the balance connector. I’ve also added some basic math to help those determine how to size their R2 resistors in other configurations, below. In the above equation, there are a few known values. 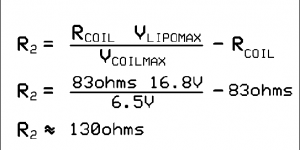 If you’re using the Panasonic DSP1A-L2-DC5V, the datasheet will provide RCOIL (the coil’s resistance) and VCOILMAX (the maximum voltage that can be applied to the coil), which are 83Ω (ohms) and 6.5V, respectively. The maximum voltage for the LiPo (VLIPOMAX), in this case, is approximately 16.8V. If another dual-coil latching relay is used instead of the Panasonic one, refer to the datasheet for that component and look for the resistance of the coil and maximum voltage that can be applied to the coil. The other great thing about the relay circuit is that once the reverse voltage is applied, as the power to the battery pack is shut off, when the contacts release, it creates an open circuit. 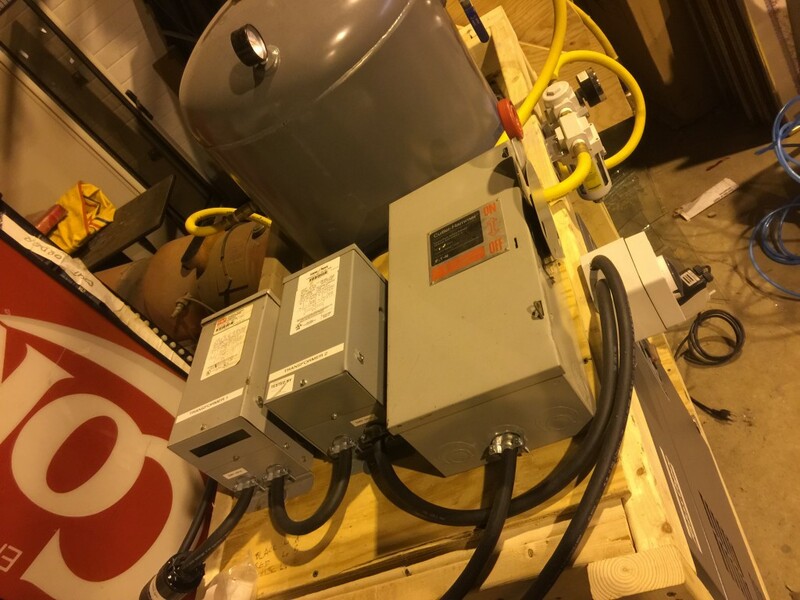 Although it may seem crude, to have two switches that allow you to turn on power, you don’t risk a constant low current draw that will ultimately drain your LiPo battery past its minimum voltage. Lastly, the auto shut-off circuit. 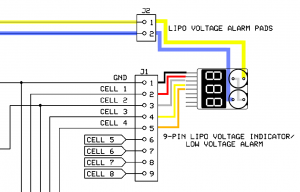 The auto shut-off circuit takes advantage of the LiPo battery alarm’s low voltage indicator. Typically, if we kept the speaker alarms on the the LiPo battery alarm, a loud noise would sound off when the battery drops past the threshold. The threshold can be set by the small pushbutton switch on top of the LiPo battery alarm. If the circuit is powered up, and the reset coil is energized to close the contact on the relay, then when the LiPo battery alarm is set off (due to the voltage of our LiPo battery dropping below the minimum allowed voltage), the set coil is energized on the relay. When the set coil is energized, the contact on the relay opens. One important thing to note is the orientation of how voltage is being applied to the reset and set coils. Make sure the reset coil has the positive voltage and ground connections aligned similarly to that of the LiPo battery alarm voltage pads. If the coils are not both positive on one side and negative on the other (don’t worry about the manual shut-off circuit with R2, because we want that specific one to be reverse voltage applied to the reset coil), the relay won’t work correctly. And that’s pretty much it. This was a really long article that I put up. 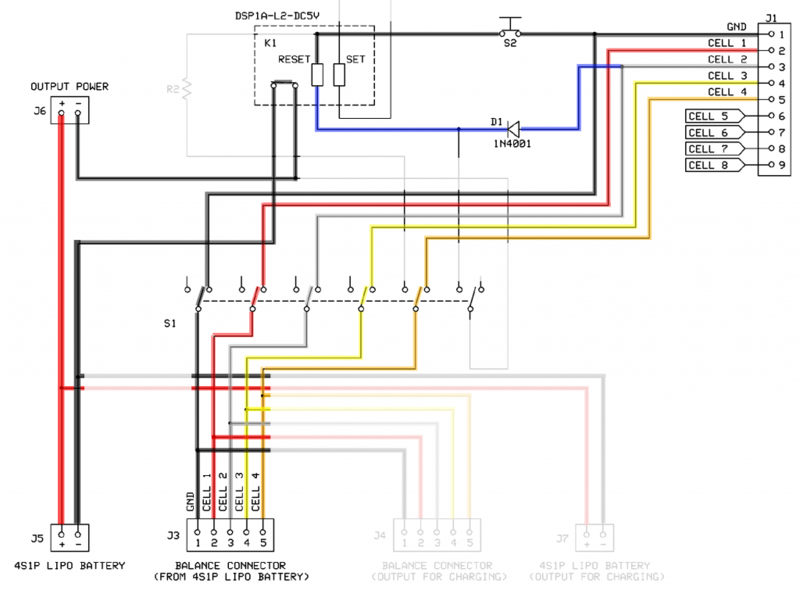 And these types of articles require a lot of work, especially when providing colored diagrams to illustrate what is happening within the circuit. If you like this, let me know. If the work is worth it for everyone to see how something works (especially with electronics), then I’ll try to put up more detailed content like this in the future. If you’re confused with anything, let me know and I’ll try to clean up the descriptions a bit more. I acquired a free drill press a long time ago. She still works pretty decently. It’s a vintage, standing drill press, in case you couldn’t tell. She’s seen better days. 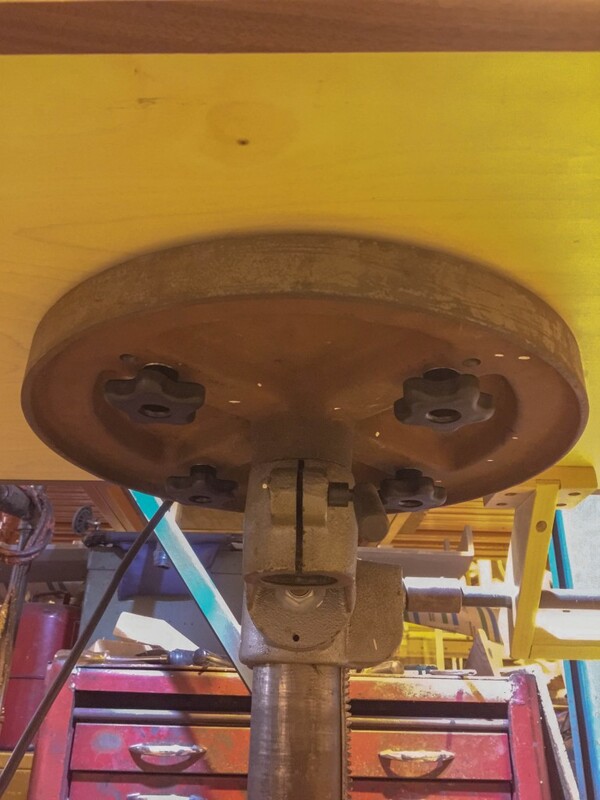 These older drill presses have a stacked set of pulleys that need to be fiddled with when changing the RPMs, unlike the new-fangled drill presses that can be controlled the RPMs by dialing the speed, digitally. The problem with the drill press was that it had such a tiny work surface to work off of. It’s a small circular surface that doesn’t hold much. 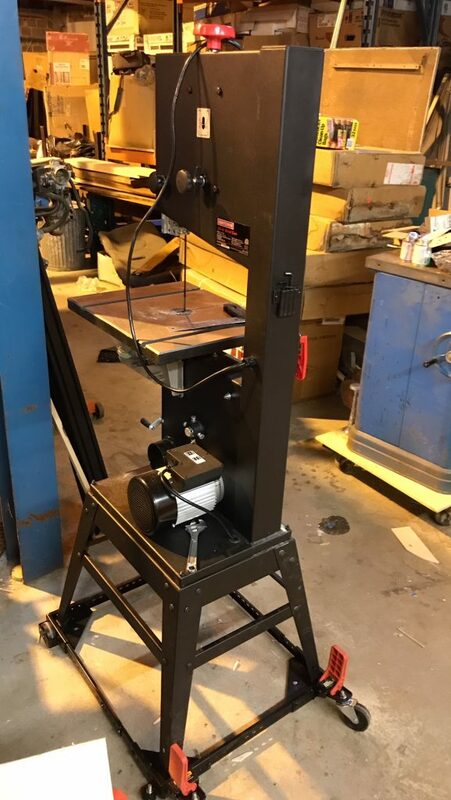 So, after looking at existing designs on the internet, I decided to build a decent, but larger table for my drill press! The most important thing I wanted was the ability to have a solid fence that had slots built into it for stop-blocks, for repeatable drilling. I also wanted to still be able to change the height of the pedestal, by extending the handle outwards. I sort of went a wee bit fancy with the look of the table. I glued up 2 sheets of 1/2″ Baltic birch plywood, and glued 1/2″ thick walnut pieces to cover up the plywood edge. I like the dark and light contrast between the Baltic birch and walnut. The surface has 2 dados cut for a couple of blue aluminum t-tracks for the t-bolts to follow on. I wanted to make the table top removable, in case I wanted to use the small table top that the drill press came with. 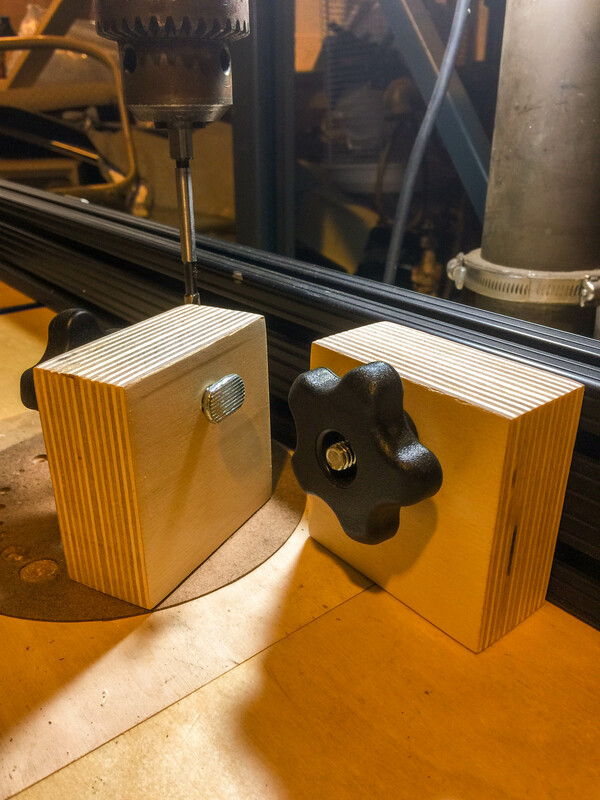 So I had 4 holes drilled into the pedestal, where I attached bolts from the table, through the drill press stock table, to some 5-starred knobs. As you can see in the image below, the stock table is TINY! I wanted to make some sacrificial boards that would eliminate tear out on the back of a workpiece, when drilling. I also didn’t want to mar up my nice Baltic birch ply-top. 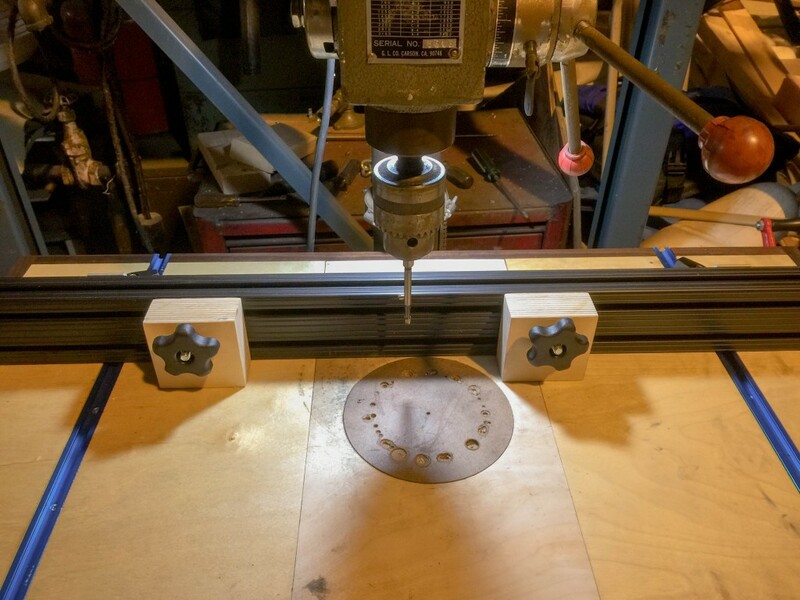 I’ve seen so many different drill press table designs that have the sacrificial MDF cutouts aligned perfectly centered to the drill bit, which always struck me as odd. 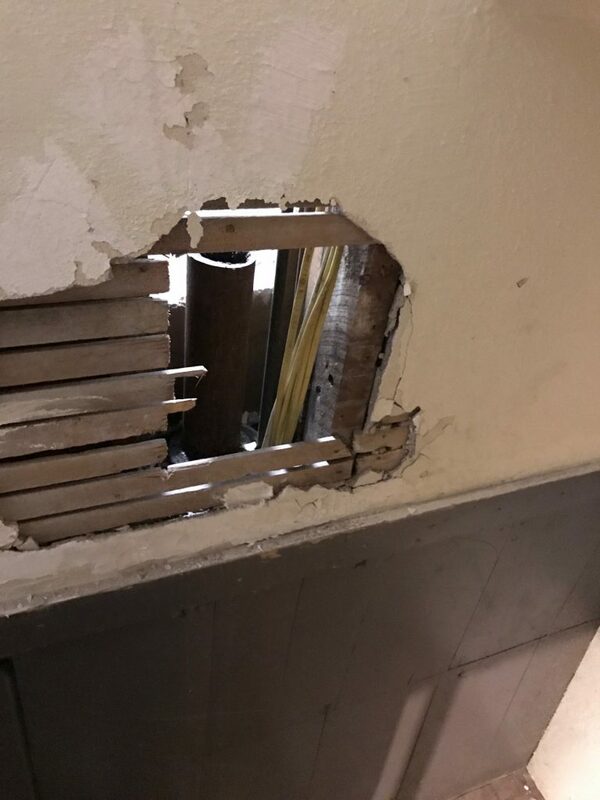 It’s always a large, square MDF piece that gets chewed up pretty quickly, since you’re making the same holes in the same spot over and over again. I’m not sure where I stole this idea from, but an off-centered sacrificial piece was a better alternative! And it’s even more brilliant when the sacrificial board is a circle, because if you needed to drill in a fresh section, you could easily just spin the sacrificial board to a clean spot and start drilling! You can see below, how the sacrificial board gets a little more use out of its life…and yes, the sacrificial board has seen better days. Making these sacrificial boards are easy as well. 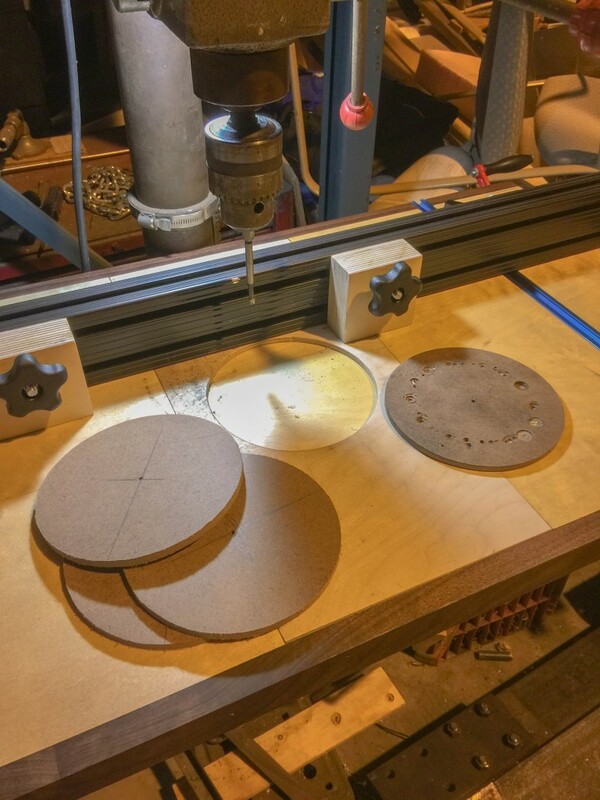 Using a circle jig that I attach to my router, I can make a ton of spares with such ease! I wanted a sturdy fence that would always stay straight and wouldn’t move with the seasons. So MDF and solid wood fences were out. I could’ve done a plywood fence, but I wanted something that was sturdy and could take a beating. So I settled on extruded aluminum. I managed to snag some 80/20 aluminum off eBay for a good price with shipping. I also knew that if I was going to use some 80/20 aluminum, I’ll need some plates and bracket pieces that 80/20 manufactures as well. So, I grabbed 2 L-brackets, some fasteners, and a mating plate, that you see at the end of the fence, below. I love 80/20 aluminum. They may be pricey, but they have all sorts of crazy fasteners for any type of ridiculous build you can imagine! No, unfortunately, I’m not sponsored by 80/20, but if they’re reading this…hint, hint! So as you can see with the left and right pics, I used some aluminum plates and brackets to create the fence. 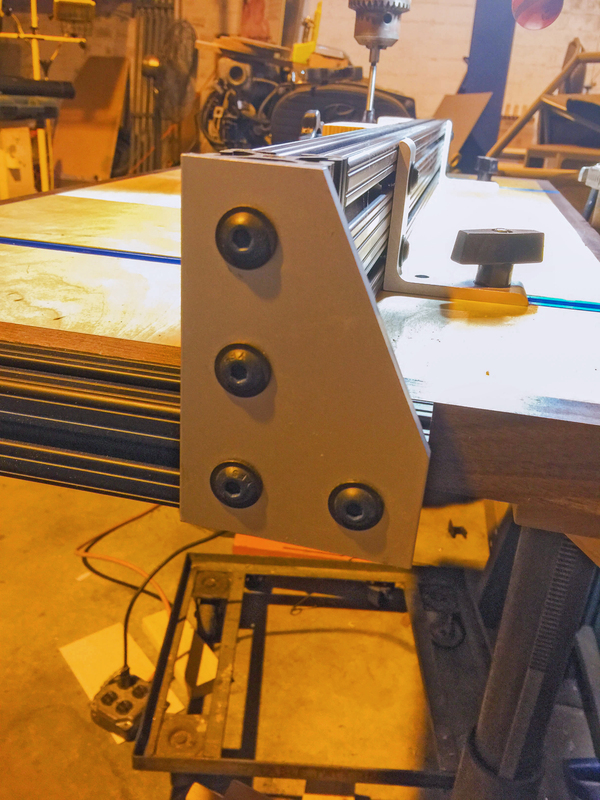 With the aluminum plate, I fashioned the main fence to attach to a small piece of extruded aluminum that is dead flush against the one side of the table. I used a speed square to make sure that the fence was perpendicular to that one edge of the table. Behind the fence, I have a small t-bolt attached through an L-bracket, fastened with a knob. When I use the fence, since I know it is always perpendicular to my sides, I’ll make sure the one side is tight against the table, and then I’ll screw down the knobs. The t-bolts ride in the blue aluminum track. 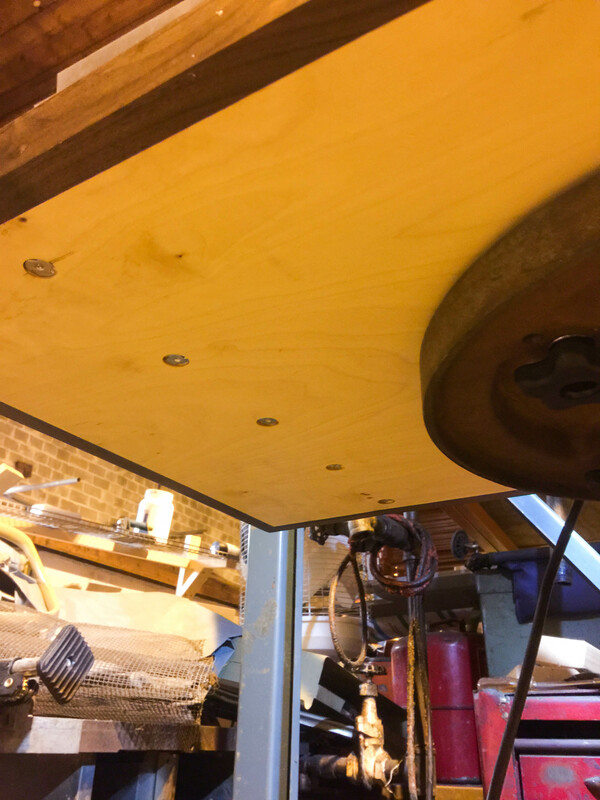 Instead of screwing the aluminum track directly to the plywood, I used some t-nuts on the underside of the plywood table. This was done because I was concerned about regular screws tearing out of the plywood if I over-tightened the knobs on the L-brackets. On the underside, I recessed the t-nuts a bit, so they wouldn’t protrude. I used some flat-head bolts to fasten the aluminum track to the t-nuts. I also made some stop-blocks for the fence as well. They were made out of gluing 2 1/2″ pieces of Baltic birch plywood, and a hole drilled through for a t-bolt to ride the 80/20 extrusion fence. A simple 5-starred knob tightens them in place. They come in handy when you’re mass-drilling multiple parts over and over again. And lastly, we have the height adjustment. Nothing too crazy. I had some spare pieces of maple that I used. I managed to find a rod coupler, with one end fastened to the stud of the gear that allows vertical movement on the drill press. The other end was fastened to a thick rod of steel. I sort of finagled the angle and the hole location for the rod to sit in the maple. Nothing too fancy. Once I got the right angle, I fastened it to the underside of the drill press table. Oh, I found a really sweet water pump handle off eBay and decided to use that as my crank handle. The old handle was flimsy and made out of plastic. 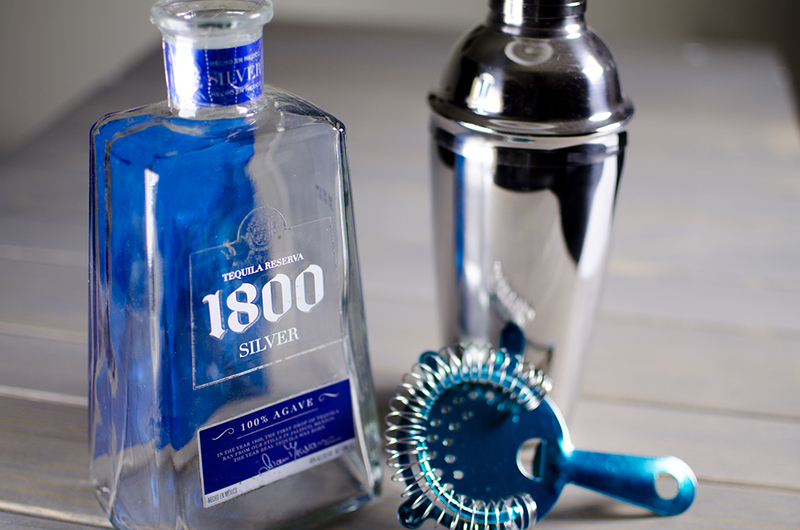 This beast is cast-iron, and works like a charm! I think I may revisit this project later in the future. I don’t like how the chuck of the drill press doesn’t clear the fence. I may split the fence in the middle and add a vacuum feature that will still provide clearance for the chuck. The steel rod that extends the height adjustment crank needs to be longer. I screwed up on the measurement and prematurely cut the steel rod a little short and it now interferes with the side of the fence. I think with the next steel rod, I’ll most likely apply some wood wax to the surface to minimize surface rust and to help “lube” up the holes where the rod sits in. Ok, ok. This is finally the first post that even remotely relates to what the website is all about. However, I confess. This isn’t exactly a step-by-step build. More of a build that’s about 75% complete. But I’ll go through some of the steps on this build. 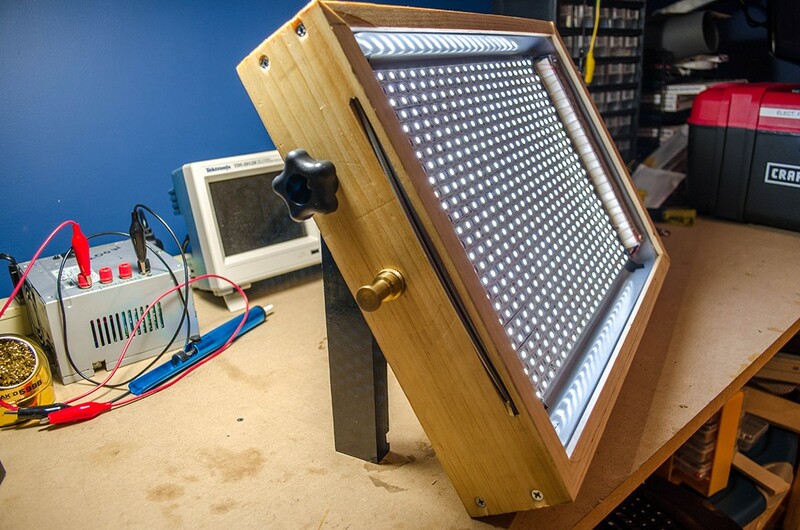 The main purpose of why I wanted to build 3 of these LED light panels was that it would be relatively cheap and provide the necessary lighting that I wanted to use for either photography or shooting video. 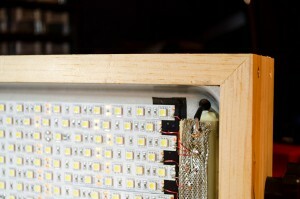 There’s a whopping 468 daylight white LEDs on each light panel! A brand new unit would cost around $500-$800, whereas the cost of each panel built is about 25%-30% of that! 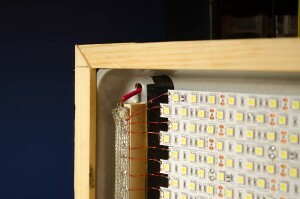 The LED array and wood box frame. I drew inspiration from DIY Perks build (you can check out the Youtube video here). I picked up a few reels of daylight white LEDs (I’ll have links to the stuff I’ve implemented under a budget breakdown table in either Part 3 or Part 4). 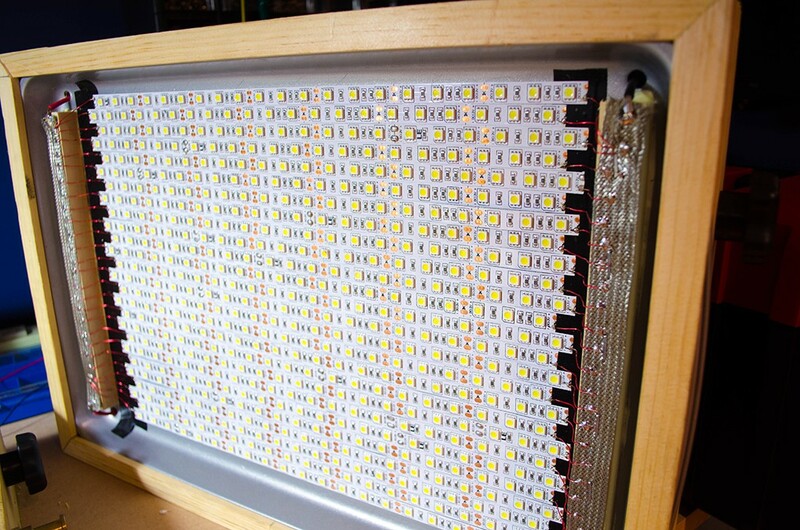 Since there are 468 LEDs, I had to use two reels to do a single panel (each reel comes with 300 LEDs on the strip). I decided to go with the cheapest jelly roll pan as a heatsink surface to apply the LEDs to, instead of applying it to a non-metallic backer. The jelly roll pans were unfortunately covered with a non-stick coating, so I had to rough up the surface with a cheap chisel to allow the LED strips and any adhesives to adhere better to the surface. If I had to do this over again, I would probably use an aluminum baking sheet that didn’t have a nonstick coating on it. I epoxied blocks of wood onto the jelly roll pan to raise my flat tinned copper braids, off the surface, for my positive and negative terminal power bars. A bit crude, but it does the job. Before applying the LED strips down, I also made sure the ends of the LED strips would lay over some electrical tape, since I would be soldering the ends to my terminal bars. I didn’t want to risk a short by accidentally solder directly to the metal surface. That’s why you see the black electrical tape. Once the LED strips adhered in place onto the jelly roll pan, then came time to solder the respective points on the LED strips to the terminal bars. As you can see, the left side of the panel had all the positive connections, and the right side of the panel had the negative connections. I used some 24AWG magnet wire to bridge the terminal bars to the LED strips. These are coated in enamel which burns/melts off quite easily with a soldering iron. Once this was done, I decided to make a wooden pine box frame to hold the jelly roll pan. I made a dado cut within the box to make space for the jelly roll pan to sit in. Nothing too fancy. I didn’t want to waste my time and effort hacking the jelly roll pan to fit in the pine box frame. I also made a second dado cut to allow a 1/8″ piece of plywood to sit right behind the jelly pan, just so it would be easier to attach the electronic components onto the surface easier. I made some 45 degree mitered cuts on the plywood frame, to create the box. 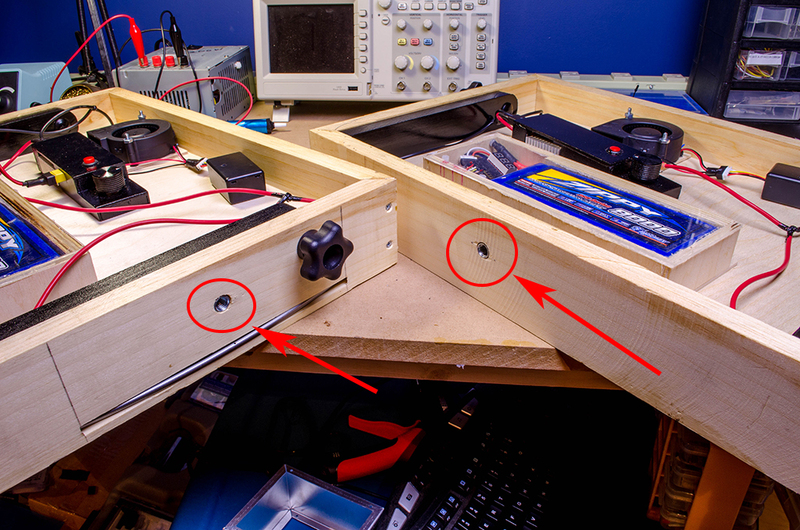 Instead of using splines (since I don’t have a real spline jig yet), I used some screws to hold the box together. For those that aren’t aware, mitered joints are weak, due to the joint being end-grain to end-grain. Woodworkers will use a wood-type joinery, instead of metal fasteners, as they’re more elegant and they don’t look awful. The build quality of the wooden box frame doesn’t scream “fine woodworking.” I know. If I took the extra time to build a decent spline jig, this wouldn’t look so horrid with the screws showing. But the screws will be covered up with some wood putty and this will be painted, eventually. I wanted to make the LED panel versatile. I wanted to add legs onto back of the panel so I can prop the light panel at an angle on the floor, to light up a background or whatnot. This is composed of a single block of wood with a carriage bolt through the top. I drilled a hole through each side of the back portion of the light panel, to accommodate the bolt through the panel. This would be held on tight with a 5-star plastic knob. I also wanted the ability to use this on a light stand, so I snagged a few brass Manfrotto threaded studs that would thread onto some t-nuts. I only needed to attach a stud to either the bottom (for the panel to sit horizontally) or one side (for the panel to sit vertically). So only two sides had the t-nuts installed. Again, nothing too crazy. Unfortunately, the Manfrotto threaded stud was longer than the thickness of the wood box frame, so I had to notch out one of the legs to make room for the threaded stud clearance. I could’ve ground down the Manfrotto stud, but I didn’t want to waste time grinding down several brass studs. Notching out the leg (as shown below) is way easier! Also note in the below picture, that I made sure the t-nuts would stay secure with some screws on both sides of it. 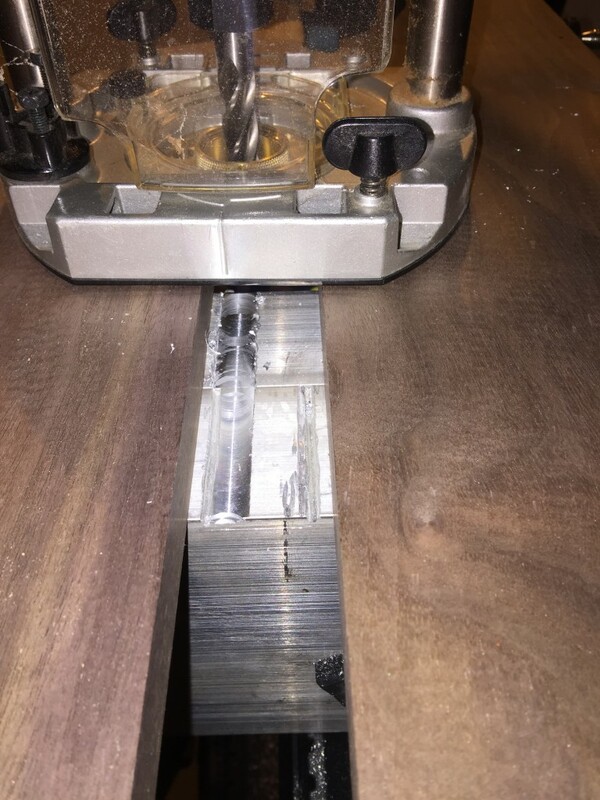 Oh, the reason why I had to recess the t-nut from the inside panel was because the dado that I cut in the pine wood, for the 1/8″ plywood, had clearance issues. So I decided to recess the t-nut with a Forstner bit on the good ol’ drill press. That was the bulk of the main panel build. A lot of planning was involved, trying to figure out how to make the cuts that I wanted, as well as the features that I wanted to add. This was definitely not a lightweight build by any means. The box alone was weighing in at under 10lbs. I would probably try my hand in some ultralight MDF next time. But the features that I had were well worth it. The ability to prop the light panel up on itself was a huge plus for me, as well as propping it onto a regular old lightstand with a tilt attachment (see picture below). To simplify the build, I went with some cheap electronic parts off of eBay and AliExpress. There are some people that complain about the Chinese DC-to-DC power converters, but I haven’t had any issues with them. There are very limited instructions/manuals out there on how to use these, so I can see the challenge for most folks trying to figure out how they work. I may consider doing a write-up to breakdown these power converters so that folks out there can spend less time tinkering and more time applying these to their projects. The first part of the electronics that I wanted to get out of the way was the 12V dimmer circuit. Dimmers out on the market typically consist of a pulse-width modulating circuit, or PWM. The basics of a PWM is that there’s a duty cycle of an on and off “pulse”. Depending on how long the pulse-width of “on” time is, compared to the “off” time, will ultimately dictate your brightness level. There’s nothing wrong with a PWM dimming circuit, except they tend to show up on video footage as a pulsating/strobing lighting effect that can be undesirable. Instead, I wanted to build a voltage-controlled dimming circuit, which starts off with a DC-to-DC power converter. The one I used was a DROK DC Buck Converter, which typically steps down voltages. This type of converter is great for LED strips in boats or cars, because they can protect the over-voltage when the engine’s on. Buck converters will typically step-down voltages, and step-up currents. This means an input of 1A @ 15V, can be converted to 1.25A @ 12V. 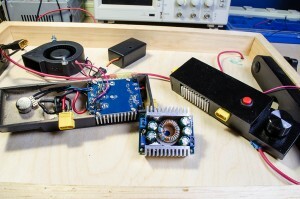 DIY Perks does a great job of how to setup the DC buck converter for the dimming circuit. As you can see in the picture above, I had to create some custom enclosures out of 1/8″ baltic birch plywood. Instead of waiting for your typical wood glue to dry, I sped up the glue process of the small custom plywood enclosure boxes with some cyanoacrylate glue, commonly called CA glue. There’s a ton of different brands out there, but I prefer the 2P-10 brand, as it was more convenient for me. There’s usually an activator spray and several “grades” of CA glue, ranging from a thin liquid to a gel-type glue. I prefer using the gel-type glue because you can reinforce the interior of these boxes with a thick gel bead, spray some activator over it, and it’ll yield a strong wood box enclosure. The cure time for CA glues is usually a minute; however, spraying a mating surface with the activator will yield a strong bond instantly. Below, I’ve created a simplified PCB layout of the modifications that were made to the DROK DC-to-DC power converter. On the bottom of the power converter, I soldered a 6.8K resistor in series with a 22K potentiometer, parallel to the onboard trimmer potentiometer pins. This provided the dimmer circuit, to dim the lighting. On the top, I had to add an extra line from the input terminal block to wire the fan controller…I’ll get to why I had to use a fan on this circuit. Once I modified the buck converter, I plopped it into my small custom wood enclosures. I went with custom wood enclosures, instead of a readily available plastic enclosures, because of the clearance of the potentiometer knob. I wanted everything on the rear of the light panels to be relatively flush to the brim of the back side of light panels. This would allow me to stack these light panels on top of each other rather easily, and nothing would be sticking out and off the back side. After I finished this circuit, I did a quick test with the LEDs and my 12V bench power supply. As noted by DIY Perks, the aluminum heat sink on one side would tend to heat up. This would worsen when you applied 15V to the input of the buck converter, and stepping down to 12V. So, to mitigate the issue, I decided to go with a centrifugal-type fan. They’re a bit pricier than your typical axial PC fan, but they can provide a ton of CFMs. They do tend to be noisy as well, so I had to use a fan controller to reduce the voltage being supplied to the fan. I soldered the input of the fan controller to the input of the buck converter. But before connecting the output of the fan controller to the fan, I made sure that the small potentiometer, on the fan controller board, was turned down so that I didn’t supply the fan with a voltage greater than 12V. 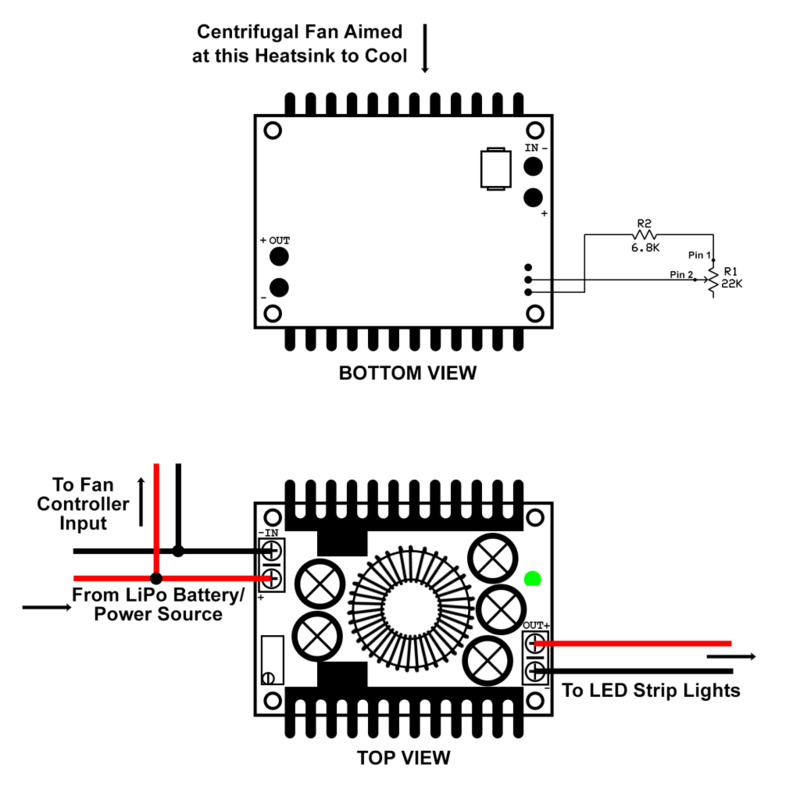 This is the potentiometer to control the fan speed, show in the image below. Since the fan itself was pretty powerful at 12V, but overbearingly loud, I stepped down the voltage to the fan to around 6-7V. I didn’t want to noise level of the fan to be too loud, especially if the light panels are being used in videography. This keeps the fan quiet, but still pushing a decent amount of air onto the one heatsink on the buck converter that tends to heat up. A cheap plastic enclosure was used on the fan controller, just so I could stay consistent with keeping most of the electronic components covered and out of the way. Also, I used a sheet of automotive gasket material for the fan to sit on, which can be purchased at any automotive store. I figured that it would reduce the amount of vibrations being transmitted from the fan to the light panel. If I were to do this part of the build all over again, I would prefer using a laser cutter or 3D printer to build a custom enclosure to house the buck converter, fan controller, and centrifugal fan in. There was some trial-and-error involved, but on future builds, I would definitely consider automating the build of the custom enclosures. Cutting each piece of plywood to the correct shape with a coping saw and hand saw is tedious and time-consuming. So, is it worth it? Well, I did a quick test shot with two of the LED light panels. One light source was at mid-brightness, aiming down from above the subject. The second light panel was at 75% brightness and it was placed standing up, towards the front left, aiming at the subject. My faux table top is too narrow for this particular shot, but you get the idea. It’s amazing what good lighting can do to your photos! In Part 2, I’ll cover the battery pack system when using the light panels in remote locations where you don’t have access to AC power. One other thing I want to add to this build are some barn doors, so I can focus the light on a specific portion of a subject, and not flood an entire scene with light. Still contemplating a decent design for that! I figure for the blog portion of the website, I’ll have random tips that may not interest everyone on the website. These are just great tips that I’ve picked up and tested. They’re not necessarily relevant with the website, but they’re nice to haves and may interest folks. I purchase my chicken breasts in bulk. A local butcher tends to sell $1.20/lb to $1.30/lb for a 10lb bag of chicken. Unfortunately, they don’t have any ground chicken. Typically I’ll do some shredded chicken, by boiling a large batch of chicken breasts for approximately 2 hours. It tends to get old, and I’ve got a few recipes where I want to use some ground chicken. 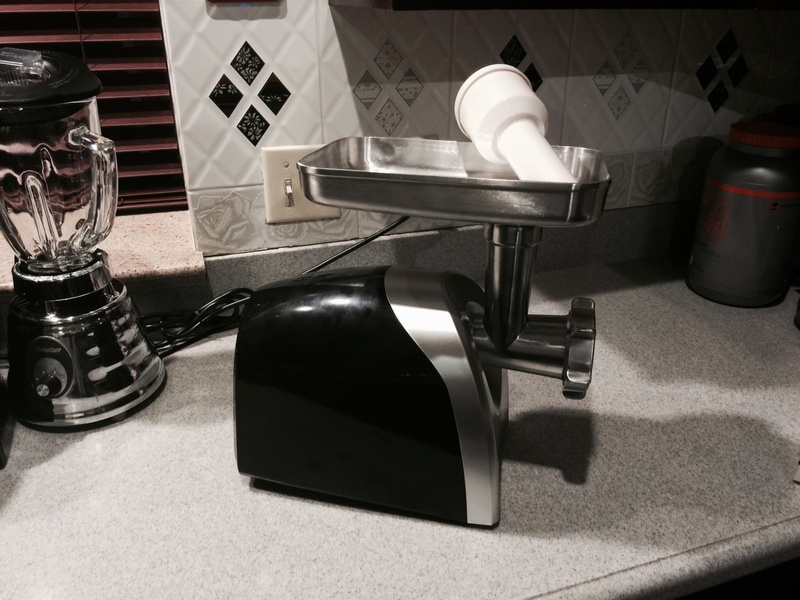 So, I decided to snag an electric meat grinder off Amazon. The bottom is a LEM meat grinder. From what I’ve read about meat grinders off many of the products on Amazon, consumers who tend to buy these machines, either electric or manual, tend to complain about the final ground product to be slow, sub-par, or the machine jams up. Fortunately, I’ve got a great tip from a friend that will help folks from ending up with buyer’s remorse! My friend Ben read somewhere that freezing your meats and the meat grinder for approximately 30 minutes will help yield a better grind. Which makes sense, since it’s harder for the machine to try and grind something blob-like vs something firmer. And ‘lo and behold. After tossing the grinding portion of the machine (not the electrical motor unit! ), and cutting up pieces of chicken in small portions, the machine had zero jam ups and one happy customer! So next time you’re going to get a go with grinding your own meats, remember to freeze the loading tray, the grinding blades you plan on using, and the meat grinding worm and housing assembly! I would highly recommend that you DO NOT freeze the electric motor assembly! 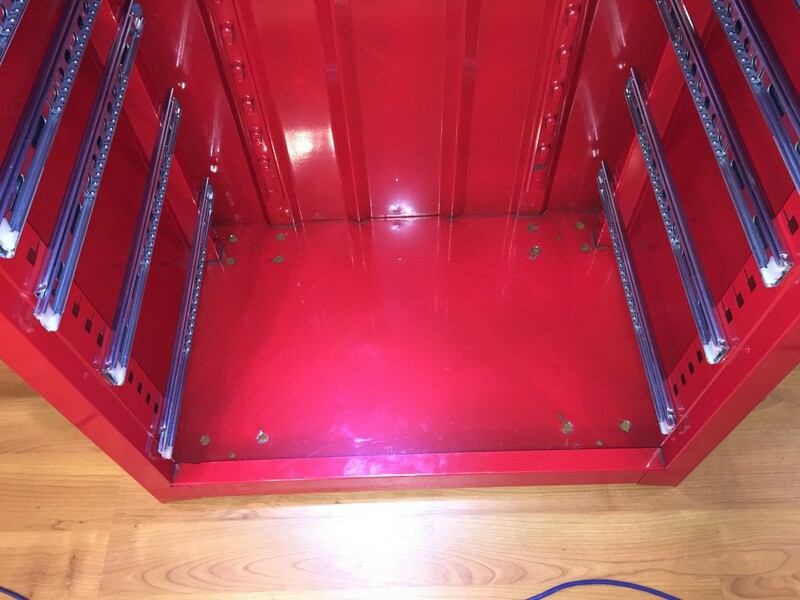 I snagged a 26″, 16 drawer glossy red roller cabinet combo (good ol’ U.S. General) from Harbor Freight the other day. This usually goes “on sale” for around $370, but if you look hard enough, you can find coupons to knock off $50-$75. My buddy Ryan linked me to a sweet HF coupon database (the Google is strong with that guy). So I managed to snag the combo cabinet for about $317. With tax, I ended up picking it up for around $334, which wasn’t too bad, considering the reviews that this cabinet gets. Now, before I get lambasted because I bought something from Harbor Freight, let’s be perfectly clear. Harbor Freight doesn’t always have quality products. The same day that I purchased the tool chest combo, an older gentleman was giving the cashier a little trouble when he returned a 12V defroster. He raged a bit about how he ended up freezing in his car, while waiting over an hour trying to defrost his windshield to no avail. Yes, Harbor Freight does have garbage. But every once in a while, you’ll find some gems that are an excellent bang for the buck, that will either work flawless out of the box, or you’ll have to tinker with it to make it work beautifully. 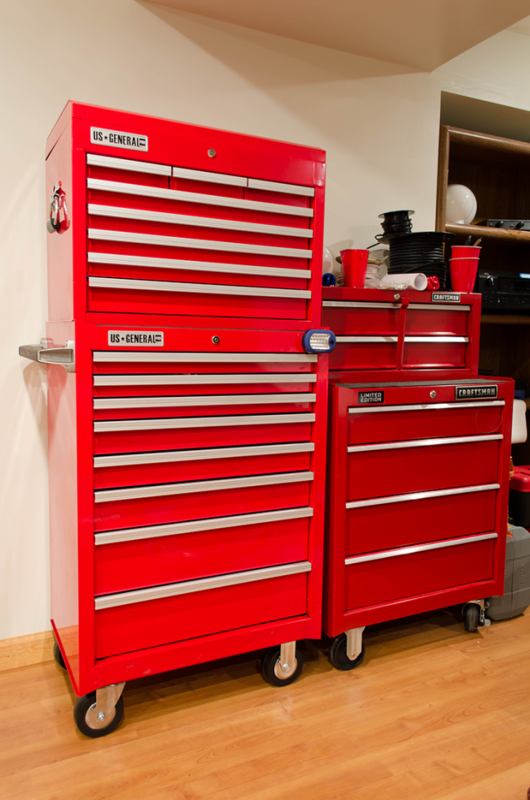 This 26″ tool cabinet combo is the latter. As you can see above, the US General (HF) cabinet, side-by-side with the Craftsman tool cabinet. Not much of a fair comparison, considering one is a the 16 drawer cabinet (HF) and the other is a 6 drawer cabinet (Craftsman). The differences between the two (aside from the slight chroma of the red paint, logos, handles, and wheels) are very noticeable. The Craftsman cabinet drawer slides very effortlessly and feels very light when opening and shutting the drawers, even when they’re packed to the brim full of tools. Whereas the HF cabinets are chunkier and heavier, which I actually don’t mind. It’s like comparing the chiclet-style keyboards on laptops vs the chunky 90’s IBM-esque keyboards. I like the refinement of the new, but the tactile feel of the old is oddly satisfying. Imagine both chests were filled to the brim, weighing about 500-600lbs total. Moving the Craftsman chest is an effortless task. The roller bearings feel like they can handle any surface. Unfortunately, this is where the HF cabinet struggles. Other owners have notice the same issue where the wheels are sub-par, and there’s a SIGNIFICANT racking issue, which is quite noticeable when you’re opening and shutting the drawers (see this Youtube video on the issue, and how it was tackled by ghostses). When you take the drawers out of both cabinet and perform a quick inspection on how the casters are attached the box, you would think that the Craftsman was a bit lacking in securing the bolts. Oddly enough, that wasn’t the case. The Craftsman drawer showed very little signs of racking/swaying when opening/closing the drawers. 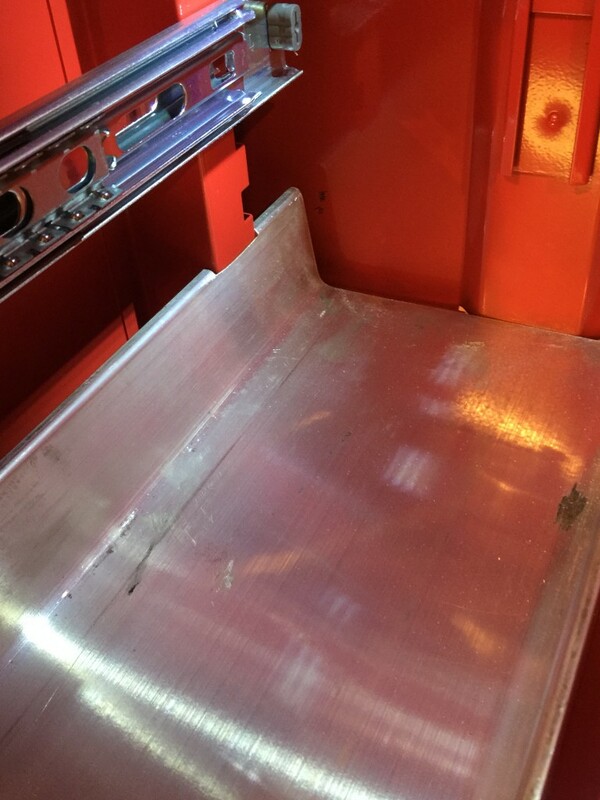 Without doing some thorough investigation by measuring the thickness of the sheet metal on the bottom of the cart, or inspecting the welds between the floor pan and the body of the cabinets, my best guess is that the sheet metal on the floor pan of the HF cabinet is thinner and isn’t reinforced as well. This assumption is further strengthened when you inspect the 44″ cabinets that HF offers (one can do a quick Google image search of the bottoms of the 44″ cabinets). It appears that they reinforced the front to back with a solid piece of rectangular tubing, right above where the casters would sit. 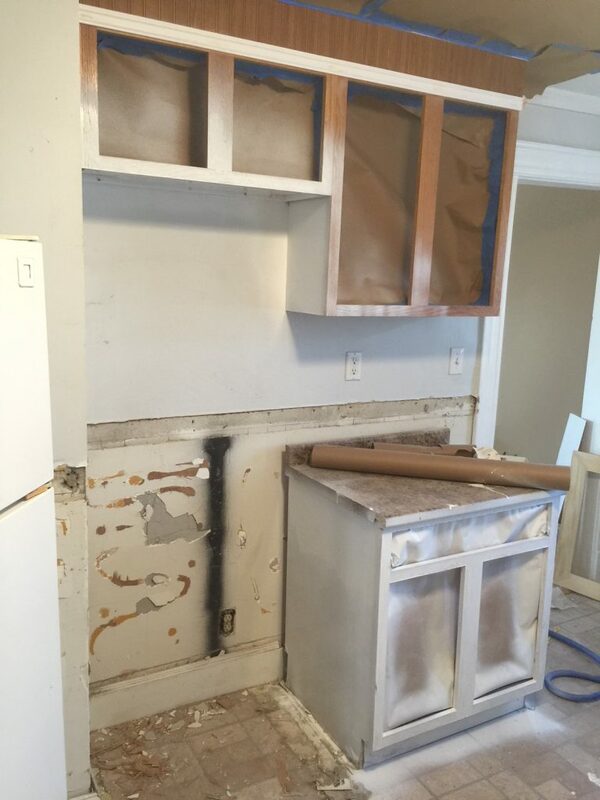 I guess the 26″ cabinets were not so lucky! 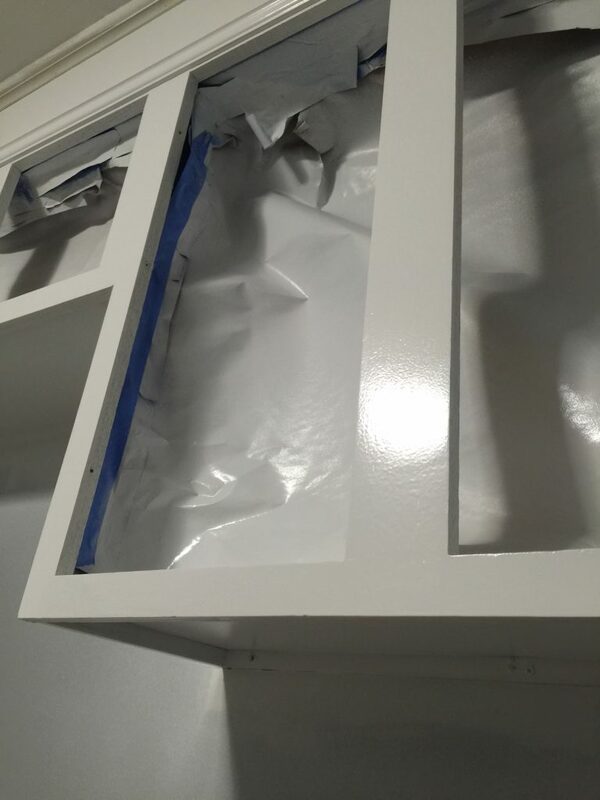 After seeing what the Youtuber ghostses did with a piece of angle iron that reinforced the inside of the floor pan of the cabinets, I decided to go with some wide channel 6061 aluminum. I went with 6061 aluminum, specifically for its structural-type applications where rigidity matters. As you can see above, I’ve also decided to go with an upgrade on the caster wheels. The cheap roller bearings on the OEM HF casters weren’t cutting it for me. I could potentially see the stock casters ending up dragging along over time, and potentially be harder to move around when I decide to move the tool chest around. Stay tuned for updates on this project! So I found myself barreling into the new year with the yearn to finally scratch a personal goal off my list. I wanted to start a small blog detailing builds and ideas that I’ve culminated over the past few years. Looking back, I’ve worked on a ton of projects, where some have been completed, and more than a handful were stuck in limbo. I’ll be honest…I do have this habit of putting projects on the back-burner because a full-time job and a social life do tend to get in the way. It’s a little harder with my current shop set-up, as it’s not as convenient as a basement or shed in the backyard. Nor is it heated in the winter. So the motivation during the winter seasons just isn’t there. But these are excuses that I’m giving myself, and it’s a new year! Stop making excuses for yourself. Bottom line is that it doesn’t have to be a new year’s resolution, or something you’ll put of until next week to get done. Get out there and do it! Whether it’s building a project, hitting the gym, or attending a network event. Never put things off. I’ll admit I’m a culprit at doing this, but putting in the effort is well worth it. And sometimes you’ll have to dig hard to get that self-motivation churning. Or maybe surround yourself with like-minded people where you can feed of each other’s motivations. If anything, this website is a good example of how I’ve put something off for too long, and I’ve finally decided…why not? …take it or leave it!